You&apos;ve got an iPhone, and have ventured into the melee of Apple&apos;s App Store, which has well over a million apps. Great news! Many of them are free. Not so great news! You&apos;ve got to sift through them to work out the very best. Fortunately, that&apos;s what we&apos;re here for, listing them here. Our selection’s sorted into handy categories, so whether you need a no-cost photo editor, translation app, sat-nav or anything else, you can just jump straight to the relevant category. Click through to the following pages for each category, but first check out our free iPhone app of the week below, and make sure you give this page a cheeky bookmark so you can keep up with our latest free iPhone app pick every seven days. 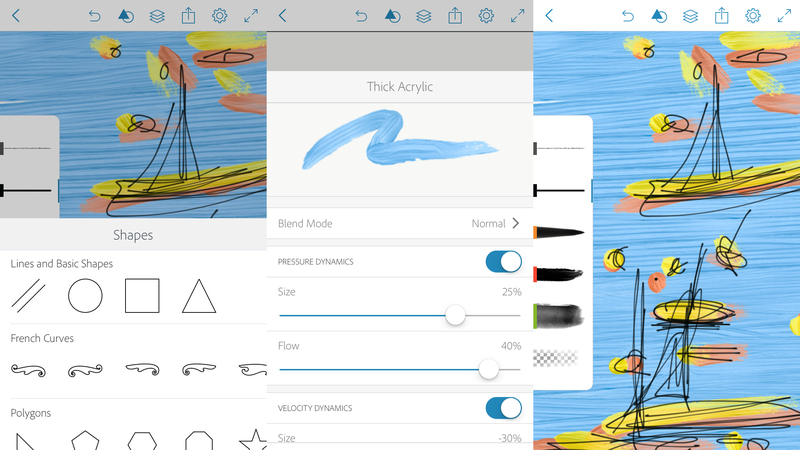 Autodesk SketchBook is a drawing app for iPhone. 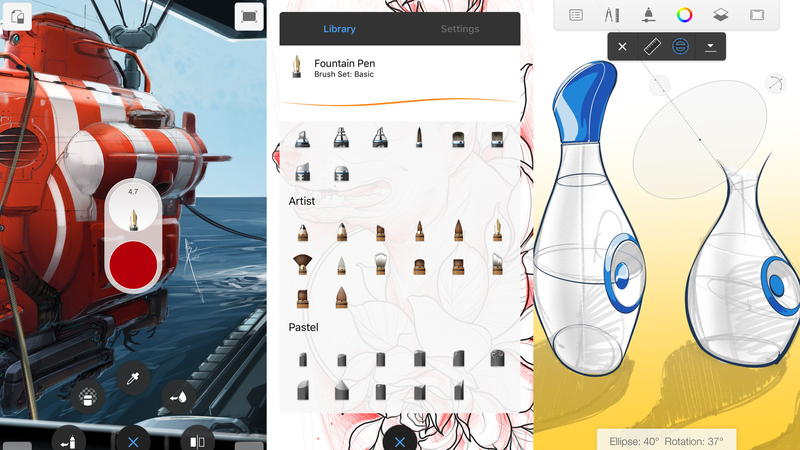 It’s of course far from alone on the App Store, but what sets SketchBook apart is the sheer range of things you can do with the app. Despite the minimal interface, there’s tons to discover. 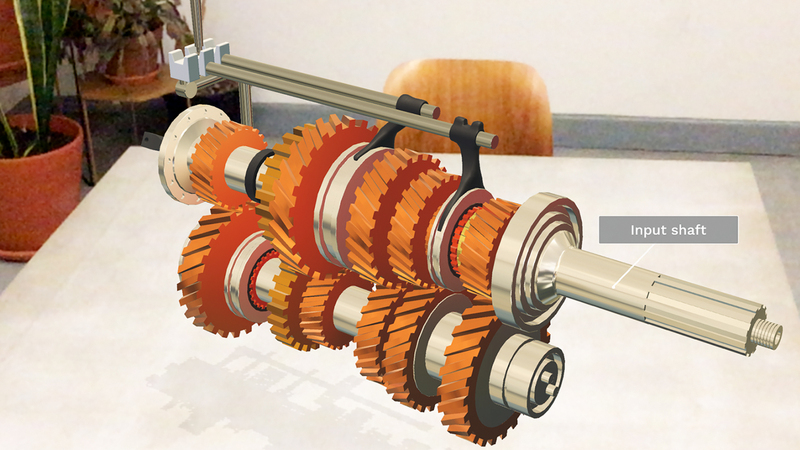 There are dozens of brushes, which mimic all kinds of real-world tools. Every one of them can be tweaked. Multiple layers afford you flexibility when working on complex compositions. And transform, shape, and text tools provide scope when you’re working on technically oriented illustrations rather than free-form doodling. You’d usually expect to pay a fair amount for this kind of quality – and once, SketchBook did have a price-tag attached. But now it’s free – and yet still superb – it would almost be an insult to not download it, even if you can barely scribble a stick-person. 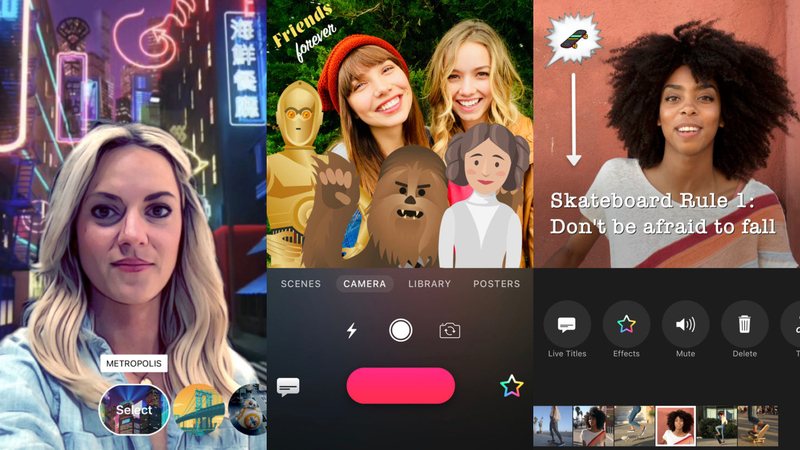 These are our favorite free iPhone apps for quickly editing videos, GIFs and Live Photos, and for creating stop-motion animation. Enlight Pixaloop enables you to animate your photos. This is achieved through you manually drawing ‘path’ arrows to define the direction of animation, and setting anchors to keep other areas of your image rooted to the spot. 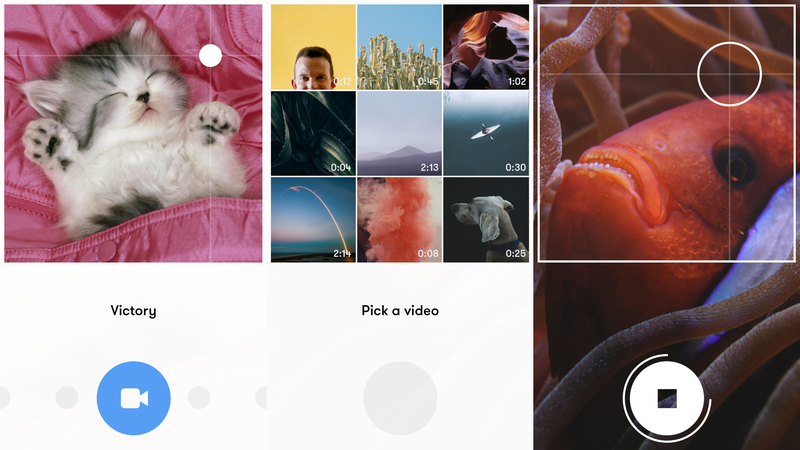 Tap the play button and you get something akin to a cinemagraph – only based on a single still image, rather than dozens of shots or a video. Whatever you create can be exported to Photos as a video (sadly, there’s no animated GIF option), but there’s plenty more you can add first, including camera wobble, overlay effects and automated moving skies. Some of those features work better than others, but the entire package is a great way to bring your photos to life. Note that there’s subscription IAP lurking, although you don’t need to pay to get a lot out of this app. Moodelizer is a one-trick pony – but it’s quite a trick. It enables you to add custom soundtracks to videos – and all you need is a single finger. You select a genre, and ‘rehearse’ playback by dragging your finger around the square viewfinder. Move up to increase the music’s intensity increases and move right to adjust variation. You can perform rehearsals using the viewfinder or with an existing video loaded from your Camera Roll. Just messing about with the audio alone is fun, but it all properly comes together when making a video. Now, when you’re shooting yet another clip of your cat being mildly amusing, Moodelizer can add much-needed excitement by way of rousing club music or head-banging guitar riffs. Vue is a video editor whose initial incarnation was an odd mix of intriguing and ridiculous. In short, it was designed to give you six seconds of fame by snapping an ultra-short video comprising three shots. Fortunately, Vue is relaxed a bit now – and all the better for it. The app still prefers brevity, but will allow movies of up to three minutes in length and can load existing videos from your iPhone, too. Once your miniature masterpiece is done, it’s possible to add filters and stickers, overlay subtitles, and mess around with zooming and adjustment sliders. 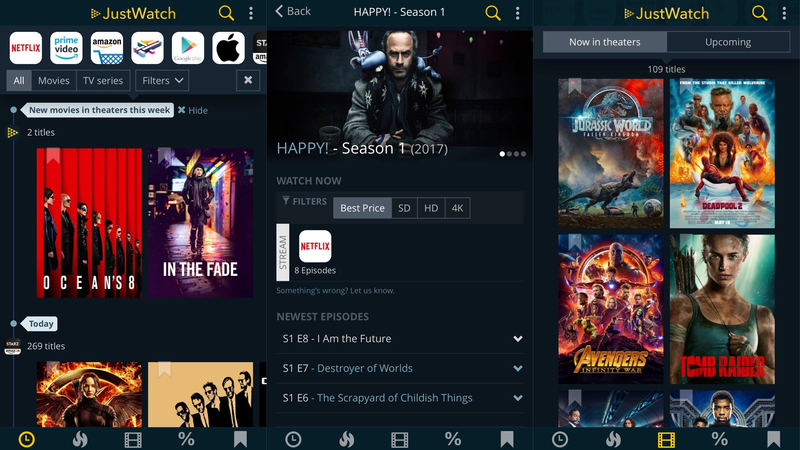 The app still feels a touch rigid compared to the likes of Clips, but Vue’s sense of focus and style – along with the sharing network that underpins everything – makes it worth checking out. 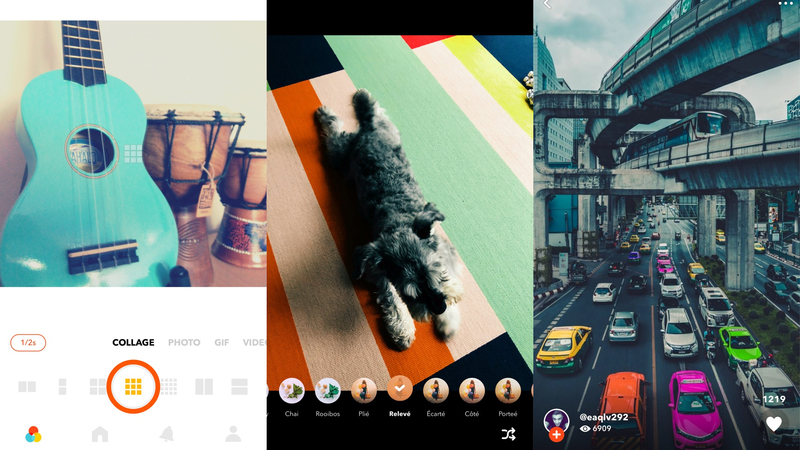 Clips is a video-editing app geared towards making content for sharing on social media. To that end, it eschews convention (widescreen, standard titles, typical editing tracks) and attempts to infuse plenty of fun into a streamlined, straightforward editing process. You can record directly in the app or import existing videos. In either case, you can overlay stickers and live captions that appear as the subject speaks, and apply filters for a different look. Posters serve as a replacement for titles, helping with pacing and context in a way that’s much more interesting, animated and editable. For iPhone X users, there’s an extra treat: animated 3D selfie scenes. These can transport you into a number of stylized landscapes, including neon cityscapes and ships from Star Wars. The effect is mesmerizing to the point where the app’s worth picking up for selfie scenes alone. Squigglish! is a very silly drawing app, on account of the fact that its brush strokes wiggle. There’s quite the variety on offer, too, from thick, snaking, gloopy lines that just jiggle a little, to spiky electrified offerings that give the impression that your artwork has just been jabbed into a socket. 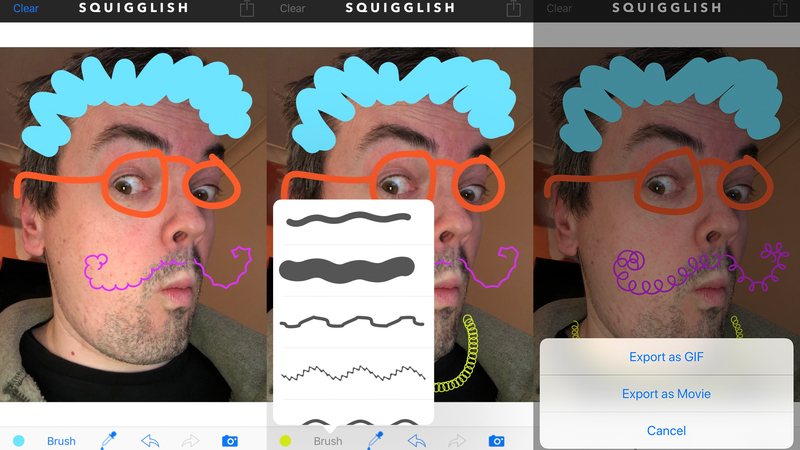 Given its oddball toolset, you’re probably not going to use Squigglish! as the basis for some highbrow iPhone art. But because you can import a photo, it’s perfect fodder for making yourself or a friend look vaguely ridiculous, with some silly blue hair, a pair of wibbly glasses, and the kind of animated mustache Dali would have killed for. Naturally, your tiny animated masterpiece can be exported to GIF or a movie. 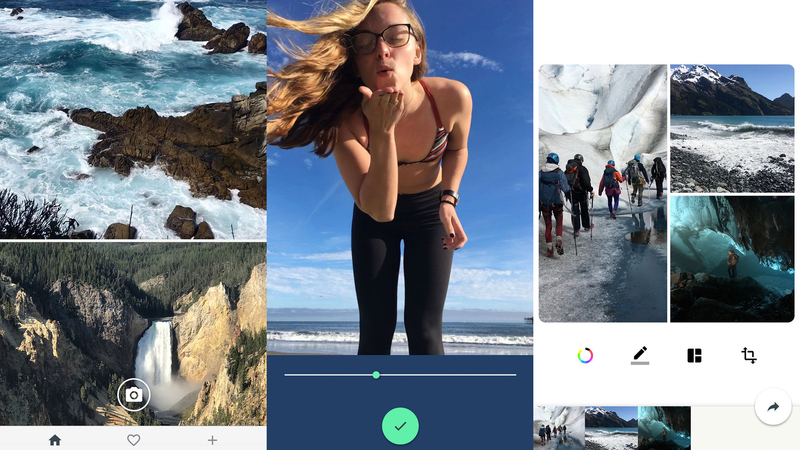 Motion Stills aims to help you do more with the Live Photos you shoot on your iPhone. Apple’s own Photos app, of course, provides options for adjusting how these images animate – but this Google offering does far more. On giving the app permission to view your photos, it will display a scrollable feed of pictures that animate as you browse. This alone makes Motion Stills worth a download, not least because the app applies stabilization technology to your Live Photos, eradicating wobble. But with a few quick swipes you can quickly select a number of Live Photos, which can then be transformed into a tiny movie. 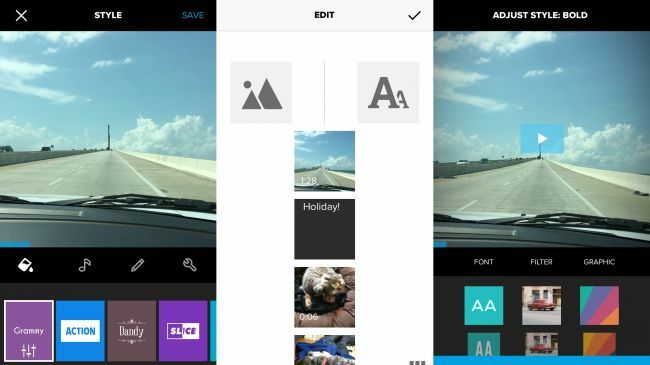 Alternatively, you can turn Live Photos into collages, or add text and emoji to your favorites. In short, Motion Stills feels like the Live Photos editor Apple forgot to make itself. If you lack the patience for working with full-on stop motion apps, but nonetheless fancy yourself as a mini-Aardman, Loop by Seedling is just the ticket. You shoot frames using your camera, and can handily overlay your previous photo in semi-transparent form, to ensure everything is properly lined up. Once you&apos;re done, you can play your photos as an animation, where tools are available to adjust the frame rate, add a filter, and mess about with grid collages, creating a Warhol-like animated GIF to share. The interface is a bit opaque – quite a lot of controls need to be &apos;discovered&apos; before you become comfortable with using this app. But once you know where everything is, Loop becomes a smart and efficient way to create charming miniature animations; amusingly, it also works within Messages, so you can reply to friends with a tiny movie should you consider the written word passé. 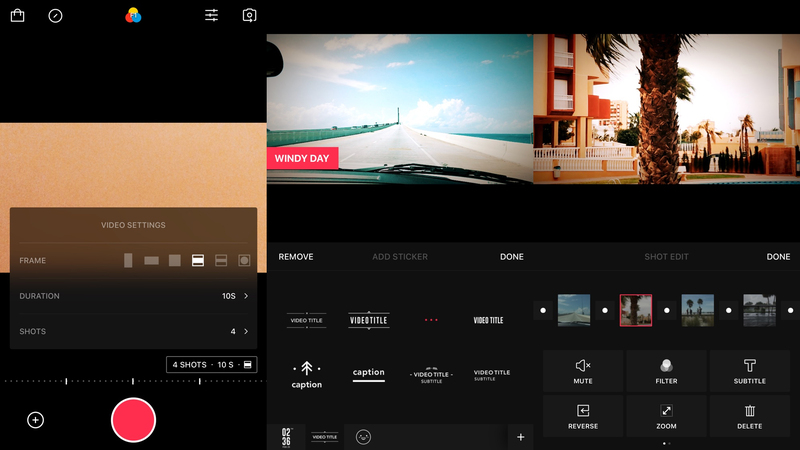 If you like the idea of editing home movies but are a modern-day being with no time or attention span, try Quik. The app automates the entire process, enabling you to create beautiful videos with a few taps and show off to your friends without needing talent – surely the epitome of today&apos;s #hashtag generation. All you need do is select some videos and photos, and choose a style. Quik then edits them into a great-looking video you can share with friends and family. But if your inner filmmaker hankers for a little more control, you can adjust the style, music, format and pace, along with trimming clips, reordering items, and adding titles to get the effect you desire. Cementing its friendly nature, Quik offers a little pairs minigame for you to mess about with while the app renders your masterpiece. And there&apos;s even a weekly &apos;For You&apos; video Quik compiles without you lifting a finger. If you used to sit there at school, doodling flick-animation masterpieces in the corner of your jotter, Animatic is the iPhone equivalent. You use simple tools to scribble on a small canvas, and then build your animation frame-by-frame. The app uses a basic onion-skin approach, meaning you can see the previous few frames faintly behind the current one, ensuring whatever you draw doesn&apos;t lurch all over the place. Once you&apos;re done, you can adjust the animation speed of your creation and export it to video or GIF. Given that you&apos;re scribbling with what amounts to the iPhone equivalent of felt pens, you won&apos;t be crafting the next Pixar movie here. But Animatic is fun, a great way to get into animation, and a useful sketchpad for those already dabbling. The app also includes a bunch of demos, showcasing what&apos;s possible with a little time, effort and imagination. We&apos;re big fans of iMovie. 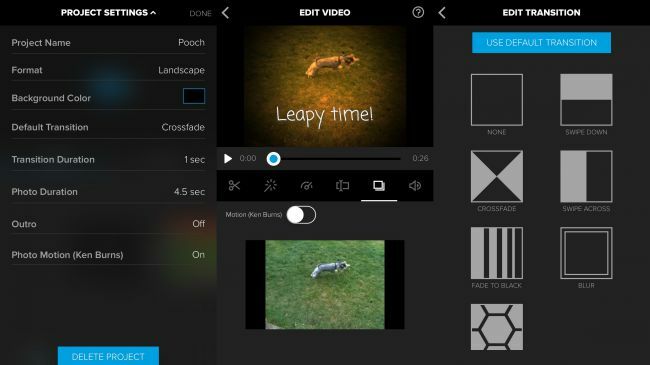 Apple&apos;s video editor for iPhone is usable and powerful. In our lazier moments, we also really like Replay, which takes a bunch of videos and edits them on your behalf. But there are times when you hanker for a middle ground, and that&apos;s where Splice fits in. Getting started is simple — select some videos and photos to import (from your Camera Roll, or online sources like Facebook and Google Photos), along with, optionally, a soundtrack. Name your project, choose an orientation, and the app lays out your clips. These can be reordered by drag and drop, and transitions can be adjusted with a couple of taps. If you want to delve deeper, individual clips can be trimmed and cut, and you can apply effects. Several filters are included, as is a speed setting, and the means to overlay text. These tools perhaps won&apos;t worry the Spielbergs of this world, but a few minutes in Splice can transform a few random iPhone clips into something quite special — and all without a price-tag or even any advertising. 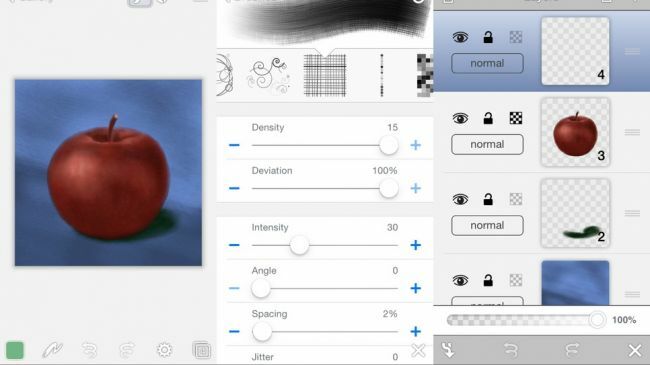 Our favorite free iPhone apps for drawing, sketching, painting, layout and animation. 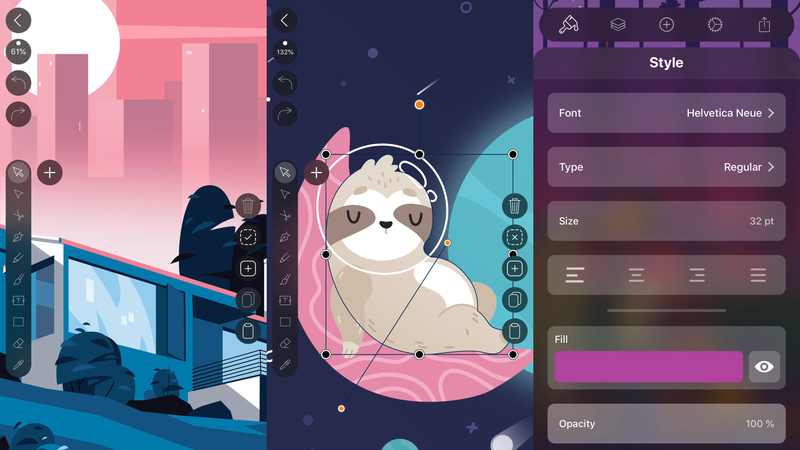 Vectornator squeezes a pro-quality vector illustration app into your iPhone. Load up one of the example images, or a blank canvas, and you’ll have access to a wide range of tools and settings. 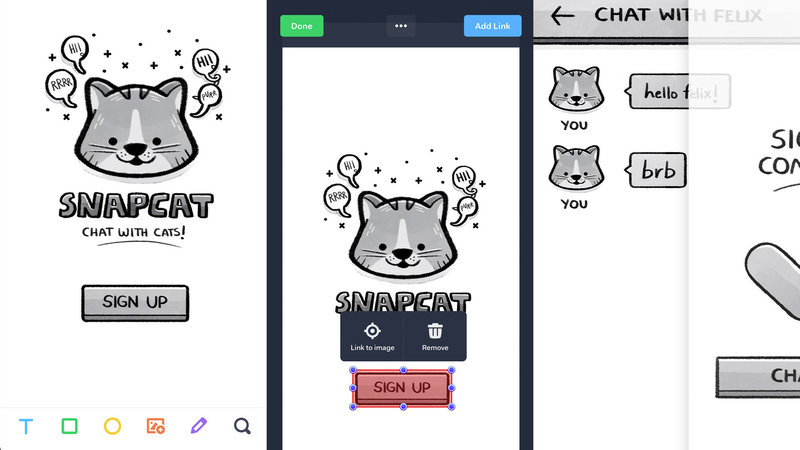 The app is usable and fluid in action, whether you’re working on a template for an app or a vector doodle. Even the largest of iPhones lacks the iPad’s screen acres, and so there are some interface compromises. Some icons are perhaps a touch small, for example, but settings sit out of sight until you need them, appearing as a tabbed menu in portrait, or a slide-in panel in landscape. Even when drawing with your fingers, Vectornator proves to be friendly and sleek. With a stylus, it’s superb – and a great way to free yourself from the desktop. That it’s free is astonishing. 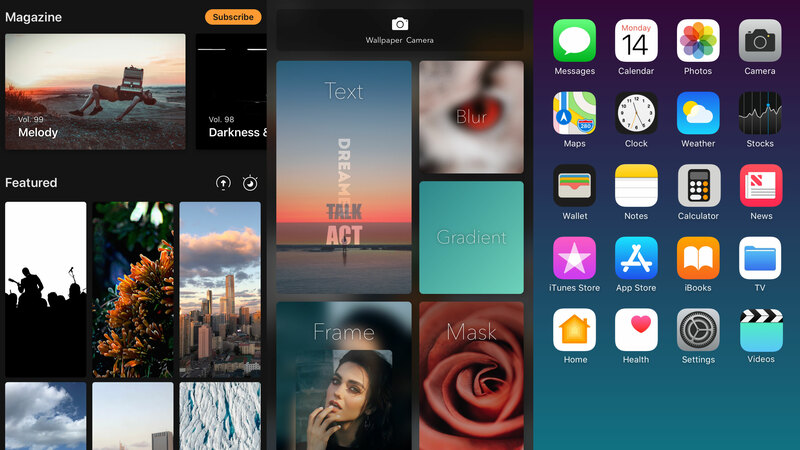 Clarity Wallpaper aims to get beautiful wallpapers on your iPhone’s home and lock screens. The main Featured feed houses all kinds of top-notch pics – although some sit behind a ‘magazine’ IAP of more heavily curated artwork. 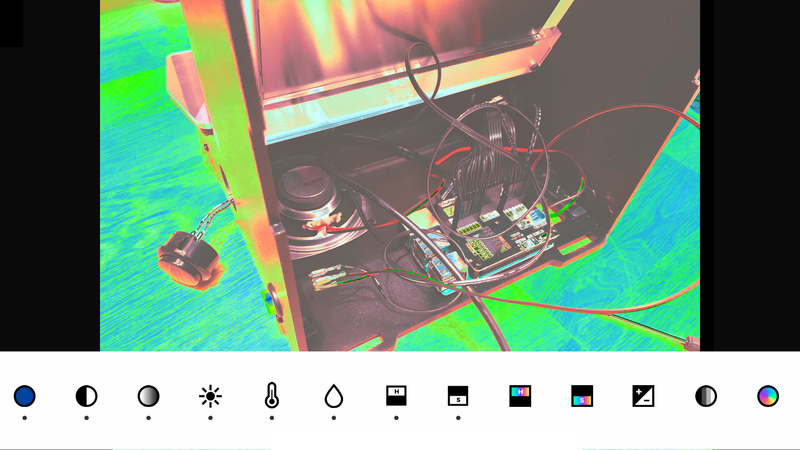 More custom options sit behind the editor button: Blurs and masks (gradients atop a picture) can be created without limitation for free; dozens of color-only gradients are also available for selection. Everything can be tested against a preview home screen prior to saving. Doing more (custom gradients, screens with text and custom frames) requires a one-off $2.99/£2.99/AU$4.49 ‘Pro’ IAP. But even if you stick with the free version, there’s no doubting this is an excellent app for quickly getting some sleek, effective wallpaper for your iPhone. 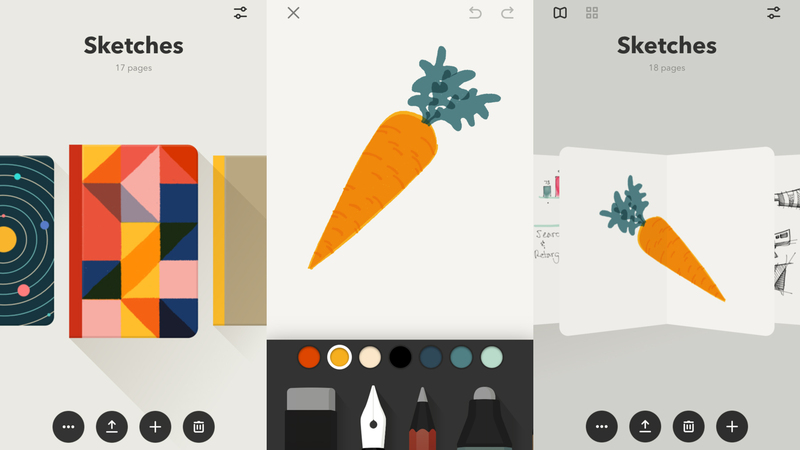 Paper is a sketching tool based around jotting down ideas quickly. Your drawings are stored in little digital notebooks, which you can open and flip through. 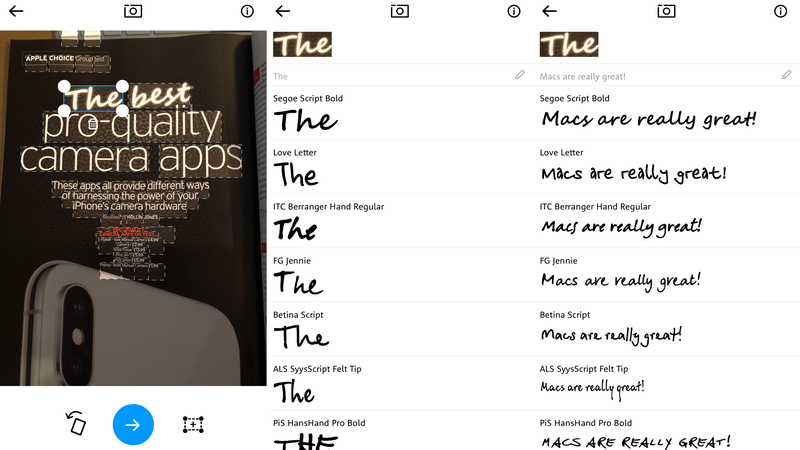 Tap a page and you can scribble with a finger or stylus using the app’s selection of brushes. There’s a smattering of additional handy tools in the free version, most notably the ability to add text notes to any picture, and the means to export a note or book. However, some features sit behind monthly IAP, including photo import, copy/paste, and auto-correct when drawing geometric shapes and lines. Despite these limitations – and the app rather oddly reorienting your sketches on iPhone when you return to browsing – Paper remains one of the most pleasing apps of its kind, not least if you retain a fondness for real-life versions of the little notepads the app depicts. WhatTheFont is a tool for identifying typefaces, and it’s extremely simple to use. You can either load an image from your iPhone or take a photo using the app. It figures out where all the words are within a few seconds, or you can drag out a selection yourself. You then tap on a selected word, and the app scoots off to find matches. The likelihood of perfect matches is slim – it depends on having a very clear image to start with, and the font being available on the MyFonts service – but during testing, the app was bang-on several times. Even when it wasn’t, it offered up something that at least captured the flavor of our original font. Whether you’re a jobbing designer or someone who puts together the odd newsletter, WhatTheFont is an excellent freebie. Canva is a graphic design tool for the rest of us. It’s not going to send professionals scurrying for the shadows, but with its mix of templates, filters, and editable design elements, it gives the average iPhone owner a fighting chance of working up an invite or poster during a lunch hour. Layouts are smartly targeted and categorized, and move beyond typical posters, greetings cards and flyers into social media territory (Twitter headers, Instagram posts and blog posts), and even business (cards, logos and presentations). You can import photos, add text, and fiddle around with a wide range of drag-and-drop elements before sharing directly to social media, or saving your work to your iPhone. For anyone who wants to design something for their burgeoning home business, or just for fun, Canva is a great place to start. Arty initially resembles yet another filter app – and, to be fair, it does have a bunch of filters lurking that can turn a photo sepia, or make it so vibrant that your eyes hurt. But this one’s mostly about its other tools, which have been carefully designed for jobbing artists working with real-world media. There’s a grid, and various image-tweaking settings to fine-tune a photo for the magic bit, which is comparing your photo with whatever’s lurking under your iPhone’s camera. 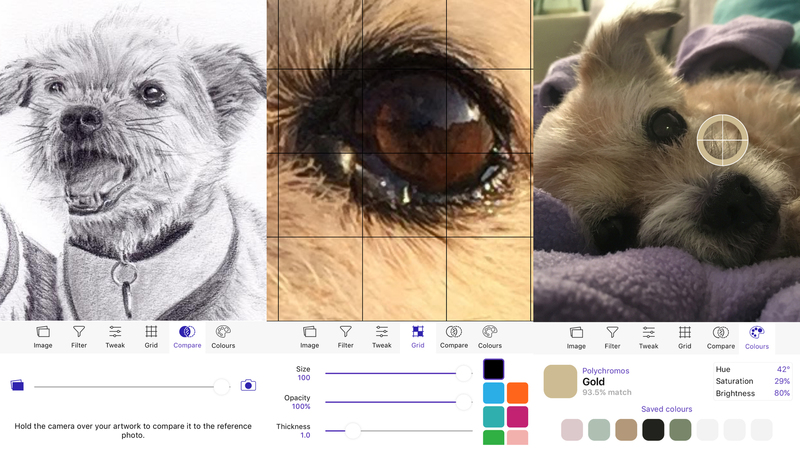 So if you’re in the midst of making a lifelike drawing from a reference photo, your iPhone can now be a handy guide to see how you’re getting on, rather than a tool primarily for procrastination. 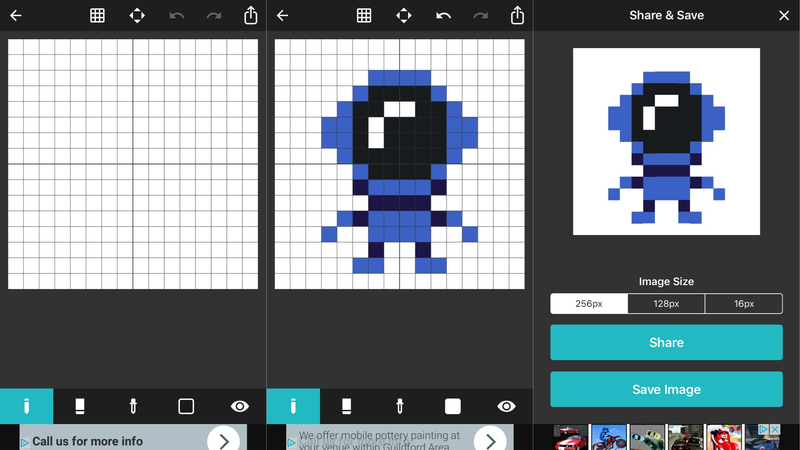 With 8bit Painter, you can pretend a couple of decades of technology evolution never happened, and create digital images like it’s 1984. On firing up the app, you select a canvas size – from a truly tiny 16 x 16 pixels, all the way up to a comparatively gargantuan 128 x 128. You’re then faced with a grid and a small selection of tools. There’s nothing especially advanced here – this isn’t Pixaki for iPhone, and it lacks that tool’s layers and animation smarts. But you do get the basics – pencil; flood fill; eraser; color selection – needed for tapping out a tiny artistic masterpiece. And, importantly, you can pinch-zoom the canvas for adding fine details, and export your image at scaled-up sizes, so it’s not minuscule when viewed elsewhere. For a freebie, this one’s pretty great. 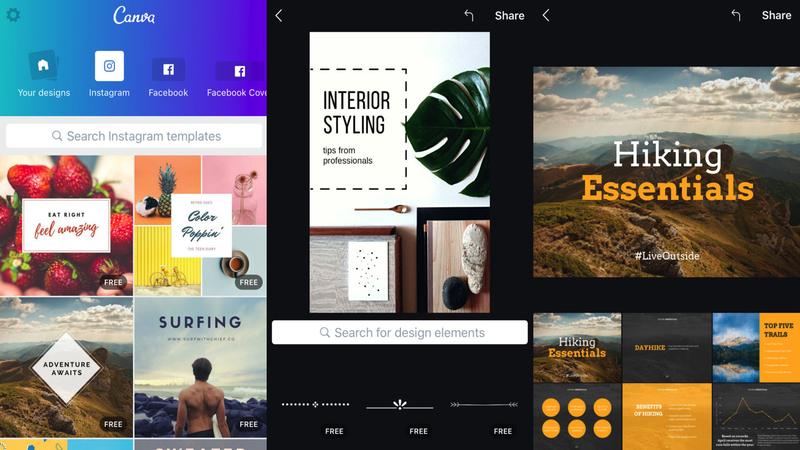 Adobe apparently has no interest in bringing full Photoshop to iPhone, but the brand’s focused Photoshop-branded apps offer a smattering of the desktop product’s power in the palm of your hand. Adobe Photoshop Sketch is a drawing and painting tool, designed for anyone who fancies dabbling in natural media. Select a canvas and you can work with virtual pens, markers, acrylic, ink and watercolor. Acrylic is nicely gloopy, and watercolor can be realistically blended as it bleeds into the ‘paper’. A layers system provides scope for complex art, and stencils enable precision when required. For free, the app’s hard to beat; and for Creative Cloud subscribers, work can be exported to layered PSD for further refinement in full-fat desktop Photoshop. Back in 2009, Jorge Colombo did some deft iPhone finger painting using Brushes, and the result became a New Yorker cover. It was a turning point for iOS and suitably handy ammunition for tech bores who&apos;d been drearily banging on about the fact an iPhone could never be used for proper work. The app sadly stagnated, but was made open source and returned as Brushes Redux. Now free, it&apos;s still a first-rate art app, with a simple layers system, straightforward controls, and a magnificent brush editor that starts you off with a random creation and enables you to mess about with all manner of properties, from density to jitter. Developer Pixite is best known for its eye-popping filter apps, and so Assembly was quite the surprise. The app is all about building vector art from shapes. Individual components are dropped on to the canvas, and can then be grouped or have styles applied. It feels a bit like the iPhone equivalent of playing with felt shapes, but you soon realise that surprisingly complex compositions are possible, not least when you view the &apos;inspirations&apos; tab or start messing about with the &apos;remix&apos; projects. For free, you get loads of stuff to play with, but inexpensive IAP unlocks all kinds of bundles with new themed shape sets to explore. It&apos;s interesting to see how far the App Store has come. Time was, Apple banned apps that gave you the chance to build prototypes. Now, Marvel is welcomed by Apple, and is entirely free. 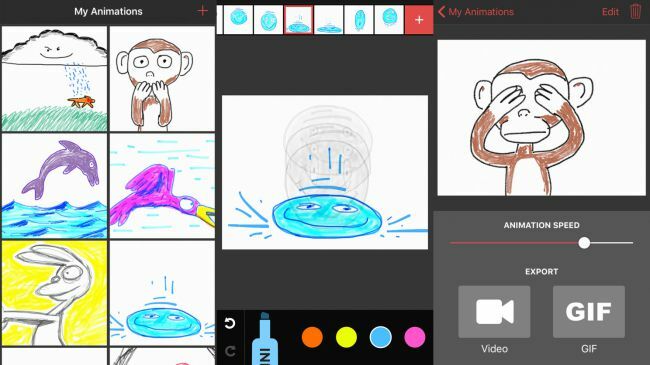 Using the app, you can build on photographed sketches, Photoshop documents, or on-screen scribbles. Buttons can be added, and screens can be stitched together. Once you&apos;re done, your prototype can be shared. If you&apos;re not sure where to start, check out existing prototypes made by the Marvel community. Our favorite free iPhone cameras, photo editors and filter effects apps. sok-edit is a collage app that doubles down on immediacy. Instead of neatly aligning photos to a grid, it’s the digital equivalent of hacking photos to bits with scissors, and sticking them on other photos for purposes of amusement and creativity. The app is tactile and noisy. You drag to cut out elements, which can then be rotated, resized, cloned and flipped. Most actions come with sound effects. It’s all a lot of fun. The only minor snag is if you have too much fun – in the sense of using three layers – you have to watch an advert to add another object, or plump for the ‘pro’ IAP. Mind you, even the latter is a mere US$0.99/99p/AU$1.49, which seems like a bargain for unlimited collage larks. Visionist has quite a lot in common with Prisma, in that it’s using neural networks to transform photos into something resembling art. The main differences with Visionist are that it affords you a level of control Prisma does not, and it doesn’t drown you in IAP and endless filters. In fact, you get just 10 (60 more sit behind a one-off US$1.99/£1.99/AU$2.99 payment), but even those have a range that can turn the dullest snaps into something pretty amazing. This is largely because you can adjust abstraction levels and how images interact; there’s support for Portrait images (and depth data is retained during export); and styles can be mixed and merged. It’s a world away from Prisma’s more simple interaction. 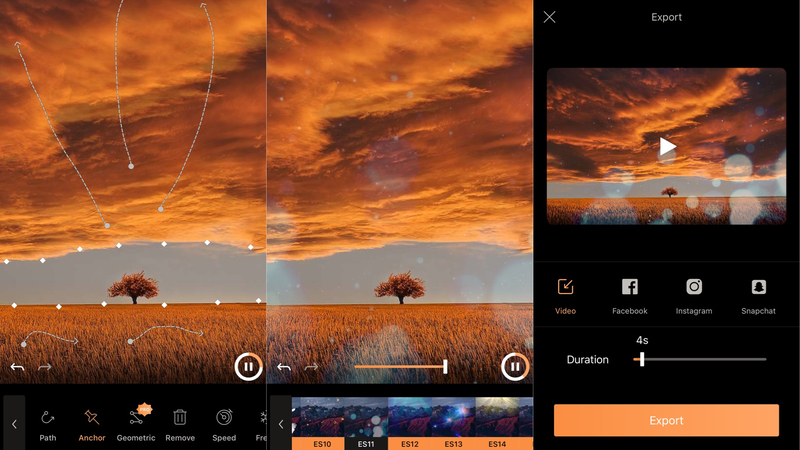 For bringing a little artistry to your photos, Visionist is well worth a download, then, whether you stick with the free version or plump for the IAP. Infltr started out as a photo filter app for people who considered choosing filters too much effort. You simply dragged your finger across the screen, and the chosen filter updated live. Simple. Fast. Random. That tool still exists, but today it’s just one of several in a photo editor that increasingly has much in common with Snapseed. Now you can make all kinds of adjustments, from fiddling with brightness through to subtly altering perspective. Edits are non-destructive, and can therefore be reverted or changed later. There are some limitations unless you’re willing to subscribe: no HD export, only saving three custom filters (rather than an unlimited number), and the odd locked tool. But the free version is nonetheless a must-have for iPhone photographers who fancy a great toolset with a dash of chance. The app gamifies your viewing, listing a daily streak total, and offering further encouragement by way of optional notifications – although be mindful those are sent 24 hours after you last used the app. Also, DailyFocus emphasizes the ‘daily’ bit. There’s no archive – miss a video and it’s gone for good. 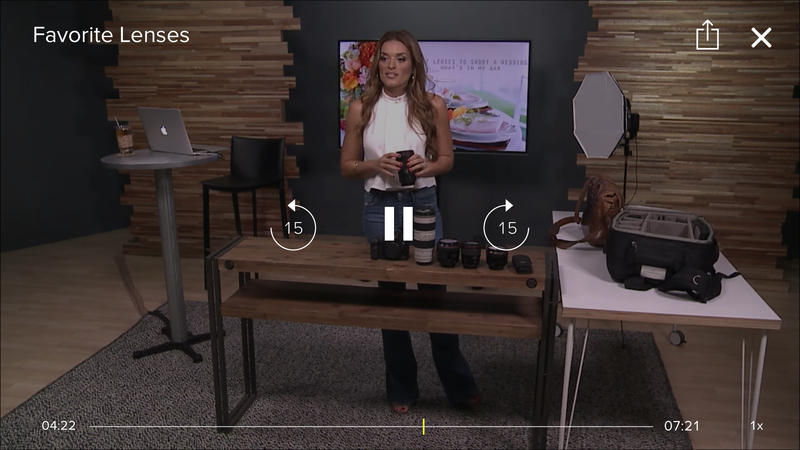 This is likely because DailyFocus is in part a teaser for a CreativeLive subscription; but for the camera-curious and pro photographers alike, it’s a fab freebie too. Retrica is a camera app designed to bring creativity, randomness and character to your iPhone selfies and snaps. It’s packed full of filters, which can be manually added live or to existing photos – or randomly if you want to try your luck by prodding the shuffle button. The filters are varied and interesting, and you can add blur and vignette effects. You can also quickly create multi-shot collages, which are automatically stitched together on a grid. There are GIF and video options too. Perhaps inevitably, the app has its own a social network, and may as well scream “We really want to be Instagram!” Still, even if you never sign in, Retrica is a superb freebie iPhone camera. 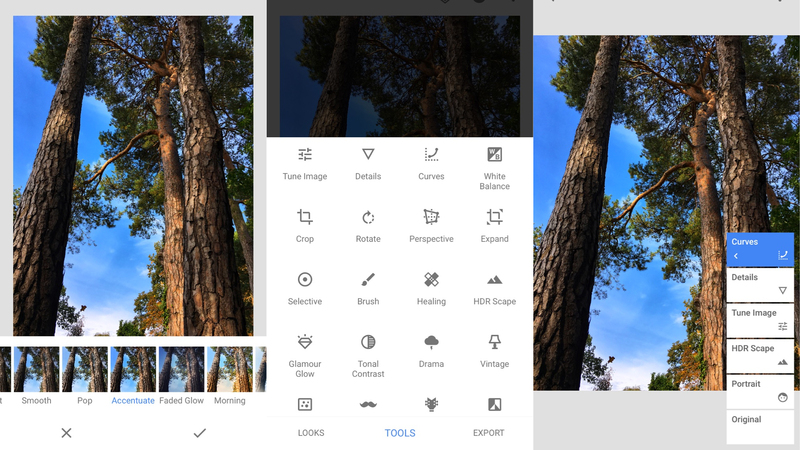 Snapseed is a photo editor that marries simplicity and power. At its most basic, it can be a tool for loading a photo, selecting a filter (referred to here as ‘looks’), and exporting the result. But it’s when you delve into the app’s tools and stacks that its true potential becomes clear. The tools menu, while a bit cluttered, offers a huge range of options for adjusting your photo. 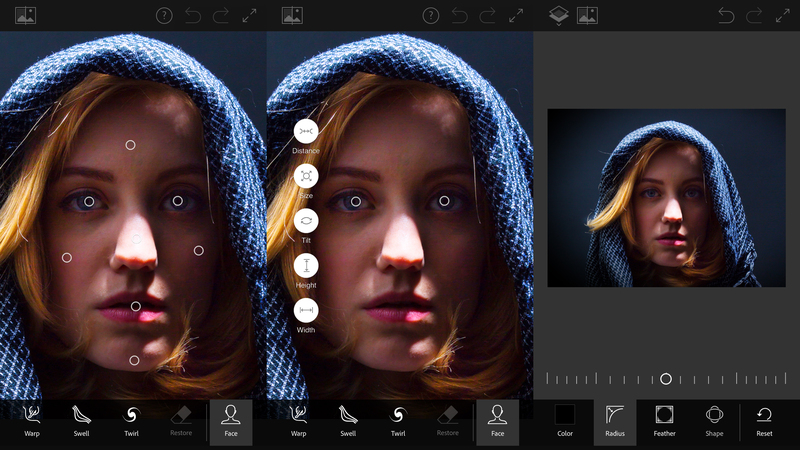 You can crop, adjust perspective, edit curves, and add all kinds of filters and effects. But stacks are arguably Snapseed’s best component. The stack is where your edits live, each of which can be updated at any time. This offers far more flexibility than editors that ‘burn in’ each change you make. Furthermore, you can save any combination of edits as a custom look – and use stacks to deconstruct pre-loaded ones. Brilliant stuff. Sticky AI is all about selfies. Shoot one (or a short video, by holding the shutter button) in the app, and Sticky AI will instantly remove its background – often with a frightening degree of accuracy. You can then get to work, resizing and rotating your beautiful face, slapping on a text label, mucking about with colors and filters, and then sharing the result to your social networks of choice. It’s naturally geared a bit towards the self-obsessed, but there’s plenty here to like: the technology’s mightily impressive, for one, but also Sticky AI neatly hangs on to your previous edits, so you can at any time peruse your collection and make a change to a favorite snap. 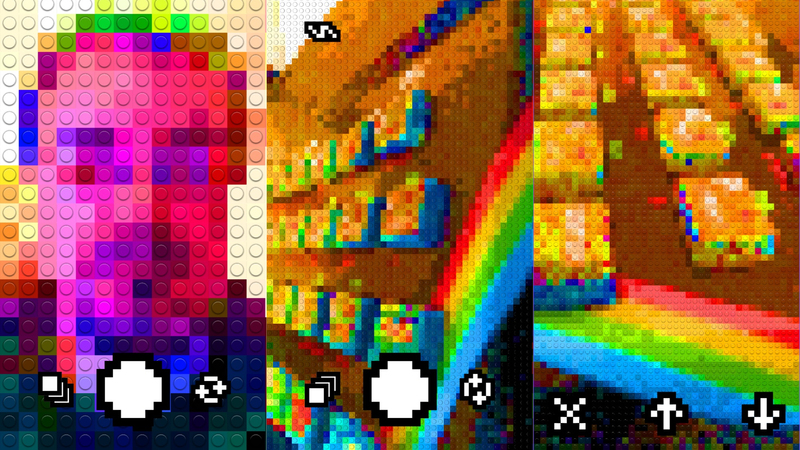 Bricks Camera is a novelty camera app that will strike a chord with anyone who has an affinity for plastic building blocks. The app’s essentially a live filter. Through its camera, the world’s transformed into a universe of brightly colored ‘bricks’, the size of which you can adjust with a swipe. Hold down the shutter and you get a short video rather than a still. Also, if you’re not feeling the vibe in live mode, you can import a photo instead. Your blocky masterpiece can be saved or shared – unfortunately only with a three-brick-wide watermark. If that bugs you, a one-off $2.99/£2.99/AU$4.49 IAP banishes watermarks for good. Regardless, this is an entertaining (if admittedly slightly throwaway) camera freebie. There’s no getting around the fact that Emolfi is ridiculous – but it’s also a lot of fun. 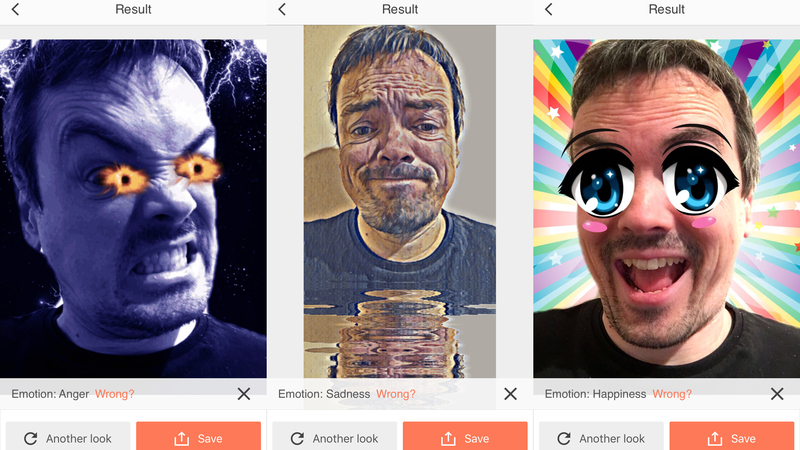 Self-described as the “first empathic selfie app”, it has you take a photo of your face, whereupon the app’s wizardry attempts to figure out your mood. The app then cuts out the background and adjusts the rest of the image accordingly. If you’re feeling happy, you might be surrounded by bubbles and sunshine. If you’re angry or scared, you’ll get something that looks like a horror movie, or a massive spider on your face with your eyes animating towards it in worried fashion. It certainly beats yet another app unconvincingly transforming you into characters from fantasy and comic-book movies. If you wonder what your iPhone would be like if graphics technology hadn’t moved on from the age of the C64, Famicam 64 can enlighten you. 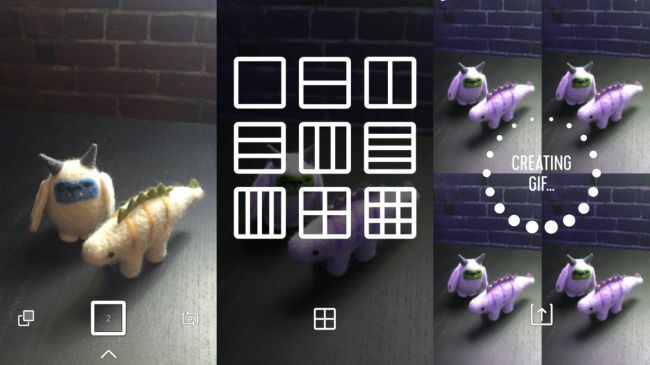 This camera app uses live filtering to replicate the visuals you might once have seen on a classic games system – or other old-school kit like oscilloscopes. 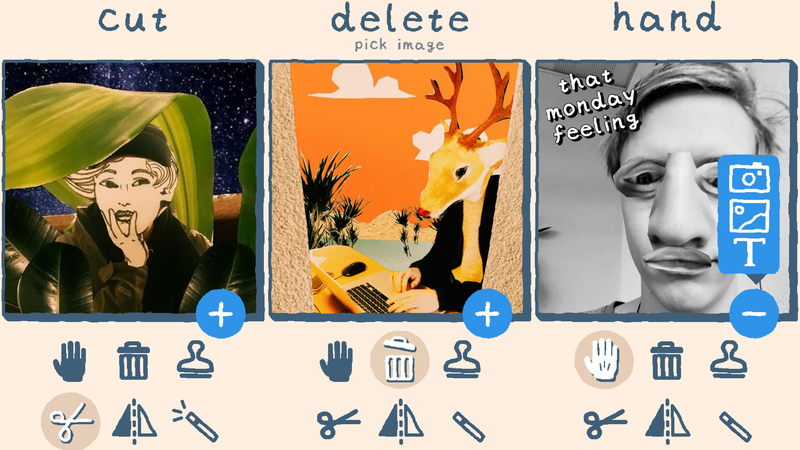 Filters can have their properties adjusted, and you can add text, retro-oriented stickers, freeform scribbles, and borders to a photo, before sharing the results. 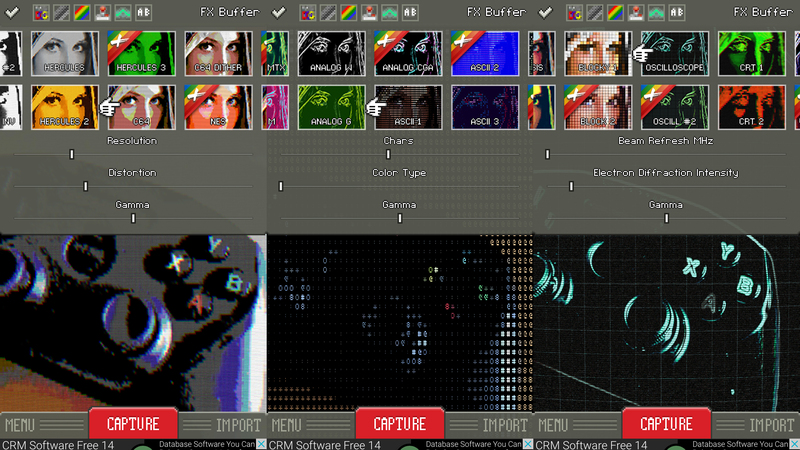 Note that some options are limited in the free version, and output adds a Famicam 64 banner to the bottom of the image. You can get rid of all that with the PLUS IAP ($0.99/£0.99/AU$1.99), but in either incarnation, Famicam 64 is a fun, quirky, usable way to do something different with your camera. 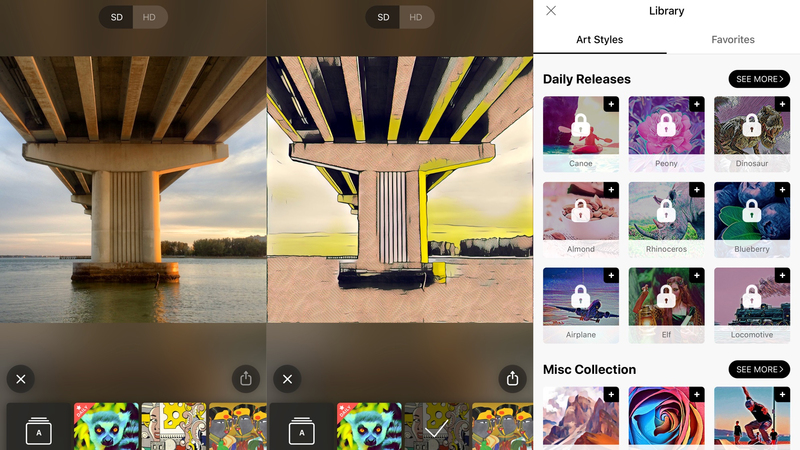 Although creative giant Adobe doesn’t seem keen on bringing its desktop software to iPhone in one piece, we’re nonetheless getting chunks of its power reimagined as smaller, more focused apps. The idea behind Adobe Photoshop Fix is to enable you to rapidly retouch and restore photos on your iPhone – using the power of Photoshop. Some of the features aren’t anything outside of the ordinary: you get commonplace tools for cropping, rotation, and adjustments. But Photoshop Fix has some serious power within its straightforward interface, too, as evidenced by excellent vignette, defocus, and color tools. The best bit, though, is Liquify. Using this feature, you can mash a photo to bits or make really subtle changes, depending on the subject matter. And if you’re facing a portrait, you can specifically fiddle with features, in a manner usually associated with high-end PC software. Following in the footsteps of MSQRD, FaceRig enables you to embody a virtual character by controlling it with your face. Everything happens entirely automatically – you just select a character and background, gurn into the camera, watch a seemingly sentient floating hamburger mirror your very expression, and have a little sit down to think about the terrifying advance of technology. 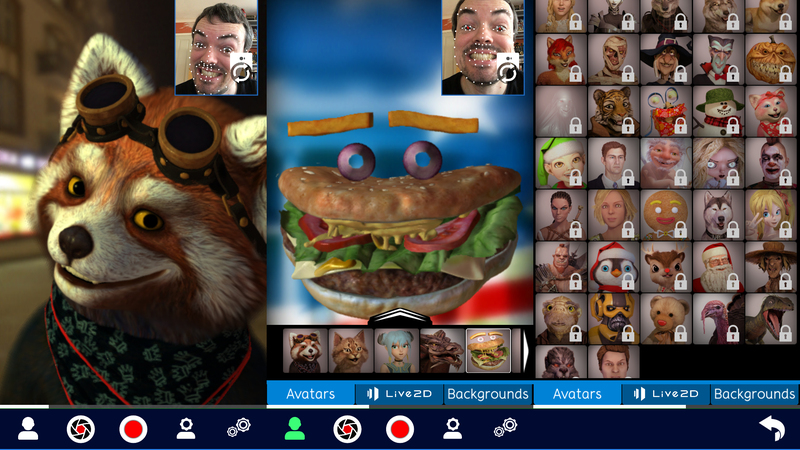 For those not freaked out by the hamburger to the point that they hurl their iPhones into the sea, FaceRig provides plenty of characters, unlocked using tokens earned through regular use or bought using IAP. 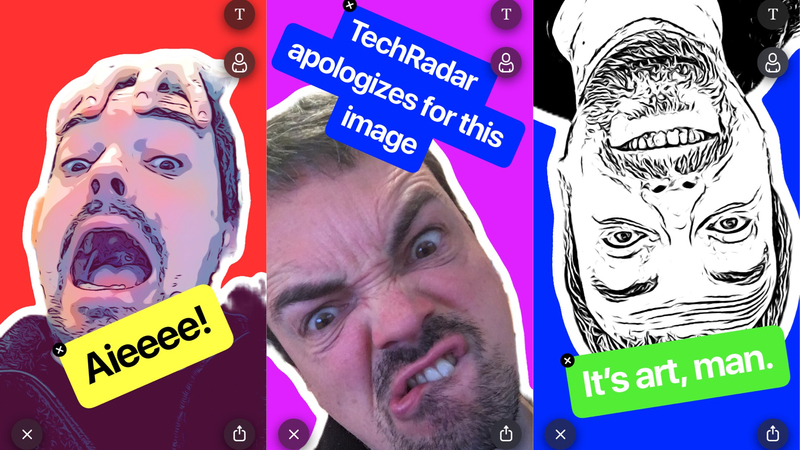 You can also snap and share photos of your virtual visage, or record entire videos where you pretend you’ve turned into a sentient goggles-wearing raccoon, an angry dragon or a slightly irritated-looking turkey. 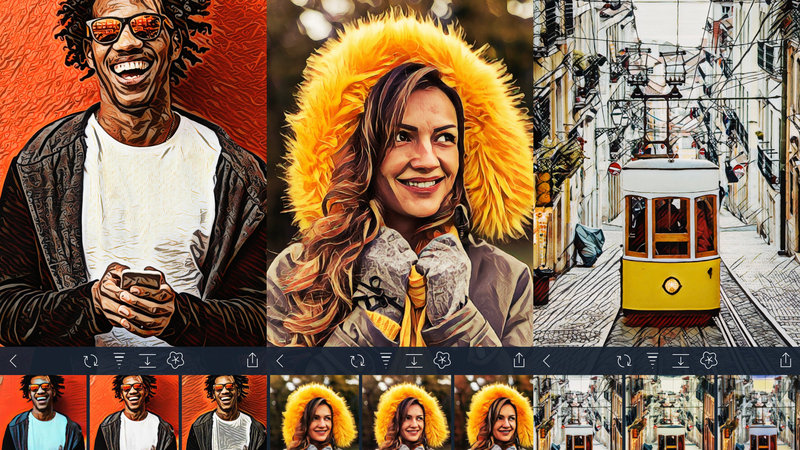 The app within a few seconds then transforms your photo into a miniature Picasso or Munch, and it’s instantly better than most of us could ever hope to achieve with Photoshop. On trying Prisma with a range of imagery, we found it almost never comes up with a duff result, thanks to some insanely smart processing. But if you find the effects jarring, a slide of your finger can soften your chosen filter prior to sharing your masterpiece online. 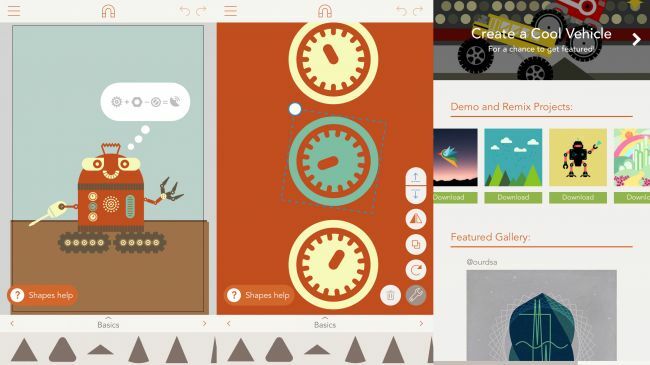 Our favorite free iPhone apps for having fun, whether reading, coloring or watching TV. Night Sky initially resembles every other astronomy app. Hold your iPhone in front of your face to view celestial bodies that are in a particular place, or rather more lazily scroll about the heavens with a finger. You get chill-out music, constellation illustrations, ‘time travel’, and information pages. But Night Sky differentiates itself in how you can interact with objects. Double-tap a planet and it’s plucked from the sky and can be explored in isolation on your screen, or examined more closely by moving around it in AR. This works for constellations, too, enabling you to better understand the distance between component stars. 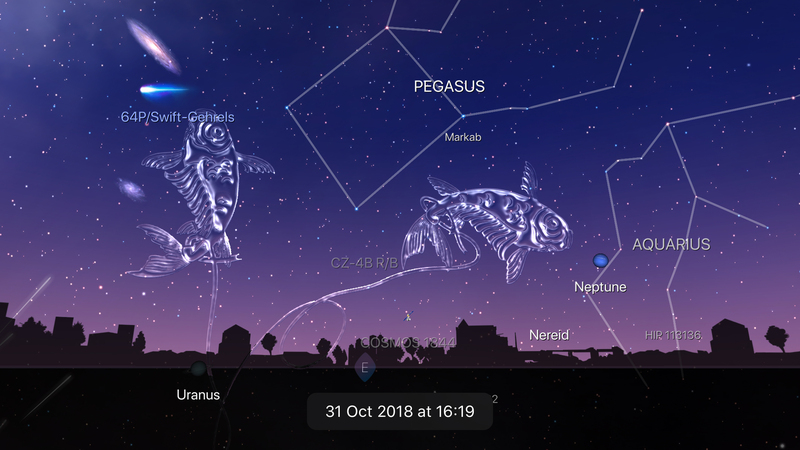 Add subscription IAP and you get an AR grand orrery, sky tours, and more; but even for free, Night Sky is an absolute must for budding astronomers. 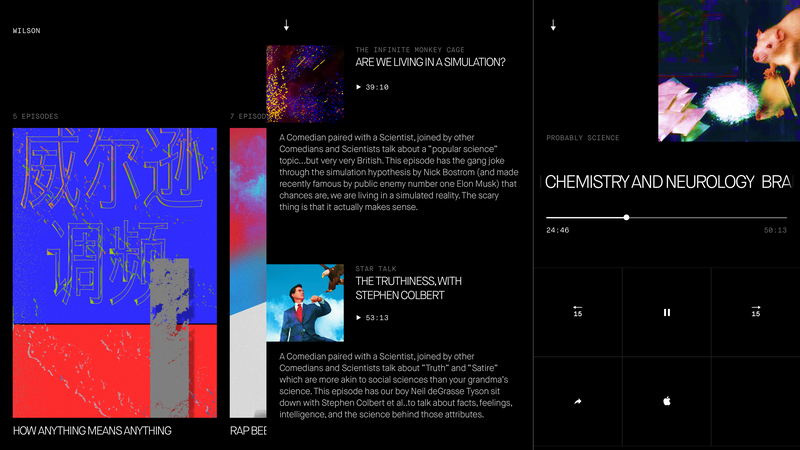 Pocket is a read-later system – time-shifting for the web. It’s designed to stop you clicking links all day, planning to read everything later, and then realizing at some point you have dozens of unread tabs. 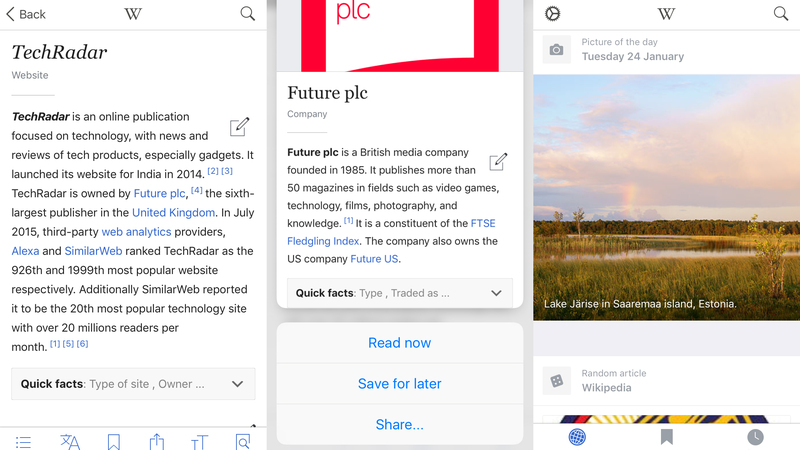 With Pocket, you simply share pages to it from Safari (or on a desktop browser use the Pocket bookmarklet). When you have a data connection, open Pocket and it will quickly download everything. When reading, articles are stripped of cruft, leaving a mobile-optimized, reader-centric view. Should you not be keen on the default set-up, it can be tweaked: fonts and colors can be adjusted, and there’s text-to-speech when you need to delve into articles eyes-free. 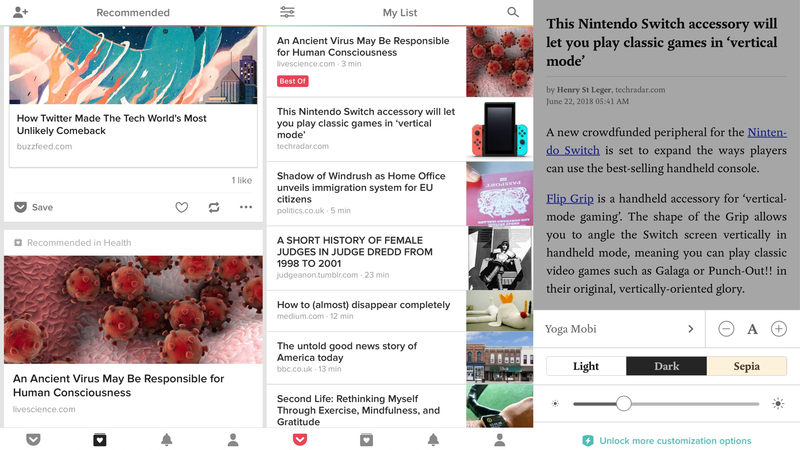 Archives can be searched; and should you run out of things to read, Pocket has a Recommended tab you can check out to find something new. Perfect fodder for your daily commute. JustWatch solves the problem of where to watch something. That might sound strange, but this is a common problem with modern television viewing – many shows are available on demand, but that’s no good if you’ve no idea what service they’re running on. When searching for something specific, the app will list where it can be streamed or bought as appropriate. If you have the relevant app installed, you can head there with a tap. If you’re looking for something new, Popular and Browse tabs give you plenty of options, which can be quickly filtered by various criteria, and individual items can be stashed in the WatchList until later. Given how decentralized television has become, JustWatch feels like a must-have install – a single, coherent tool for finding content from a range of providers. 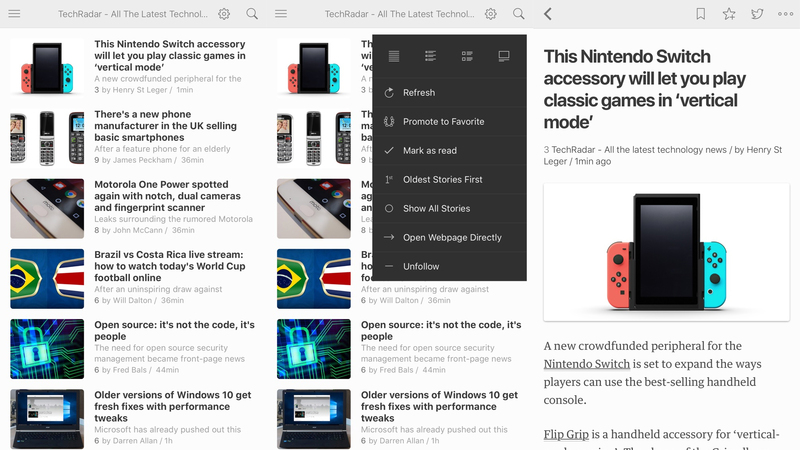 Feedly bills itself as a smart news reader. For old hands, it’s an RSS client. If you’re still making a confused face, it’s an app that enables you to subscribe to website news feeds, which then pipe headlines directly to your iPhone. The net result is a kind of curated newspaper. You get content from sources you know and trust, and because stories are listed in order of publication, you’re safe in the knowledge that you won’t miss anything – unlike the semi-randomized avalanche of content that afflicts social media feeds. The reading experience is clean and simple too – just text and images for sites that provide full articles within feeds, and a built-in browser for those that don’t. And when you find something that’s just too good to keep to yourself, there are plenty of sharing options. 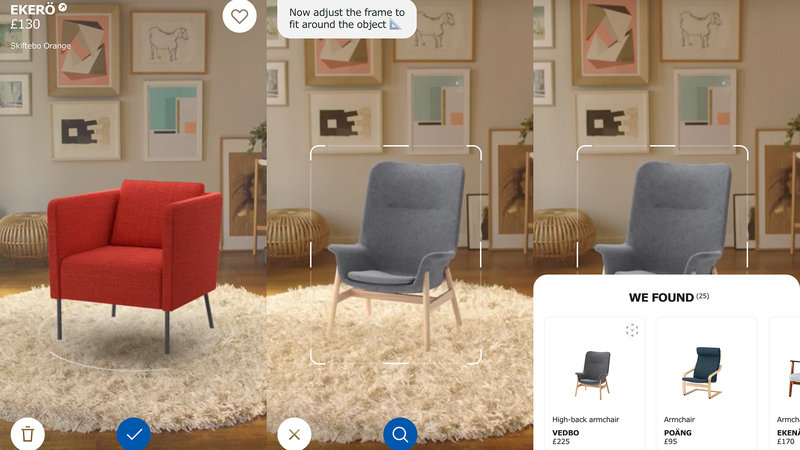 IKEA Place is ultimately a virtual catalog for the chain of furniture stores with a predilection for massive blue buildings, but it also happens to be an app at the forefront of augmented reality, showcasing the future of shopping. Select a piece of furniture and you can place it in your room. The app will also enable you to point your iPhone’s camera at a product elsewhere and find something similar on the store. This could be considered aggressive marketing, but with a little thought, you quickly realize how useful the app can be, even if you’re not planning on buying anything. If you’re wondering whether a second chair or bookcase would work in your room, use this app to give you an idea rather than bringing something home and then finding that it doesn’t fit. 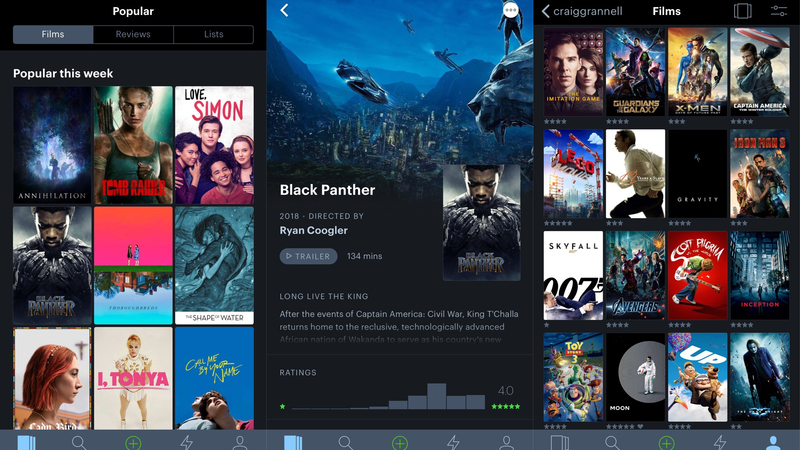 Letterboxd is a social app for people who love films. Sign in and you can see what friends have been watching, bellyache about the latest Hollywood blockbuster that totally offended your viewing sensibilities, and comment on other people’s reviews. Or if that fills you with horror, you can ignore the social bit entirely, and just use Letterboxd as a really savvy movie tracker. Search for films and add them to your watch list; once you’ve seen one, give it a rating. That way, you won’t end up 30 minutes into a cinematic disaster before realizing you’d already suffered through it before. Two apps for the price of none, Letterboxd is pretty great whichever way you use it. Notcho is one of the cheekier apps on the App Store, and would have perhaps best been named “Notch? NO!” In short, it’s designed to hide the divisive iPhone X notch. It does this by making clever edits to wallpaper, adding curved corners that hide the notch within a black bar. The wallpaper creation bit is pretty good, with various fit options, and the option to stick with straight edges or less pronounced corners, if you don’t want to ape the iPhone X’s curves. Bizarrely, you can also add the notch back in if you want to. Saved wallpapers do have a watermark unless you stump up for a one-off $1.99/£1.99/AU$2.99 IAP, but otherwise this is an essential app we wish could somehow extend to the rest of iOS. JigSpace is an education app that reasons we learn things better in 3D, on the basis that this is how we experience the real world. And that’s a good point. It’s all very well to learn how a car’s transmission works by reading about it, or even pore over an exploded illustration in a book. But being able to fiddle around with a real engine is much more helpful. This app isn’t quite that level of magical, but it does use iOS’s augmented reality smarts to project various objects onto a flat surface. These can then be explored and fiddled around with, in a manner that hints at the future of anything from repair manuals to textbooks. And even though you’ll perhaps exhaust the items on offer fairly quickly, JigSpace is a nicely immersive educational experience while it lasts. WLPPR is a wallpaper app that’s apparently not keen on vowels. 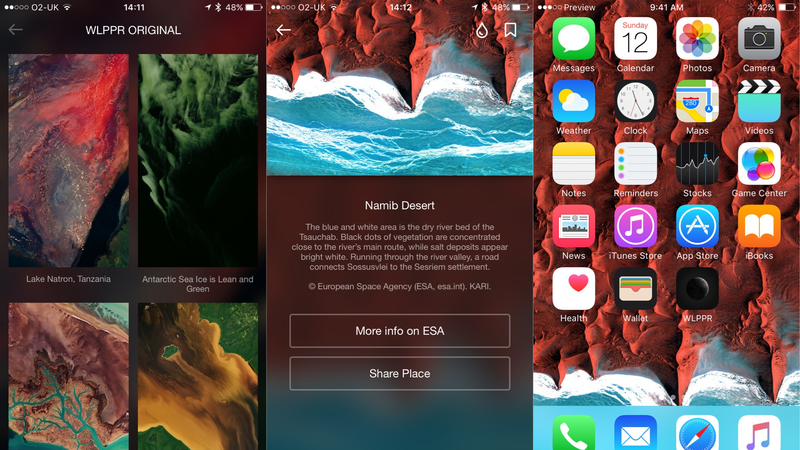 But what it lacks in letters, it makes up for with beautiful satellite imagery, which you can save to Photos and later apply to your home or lock screens. 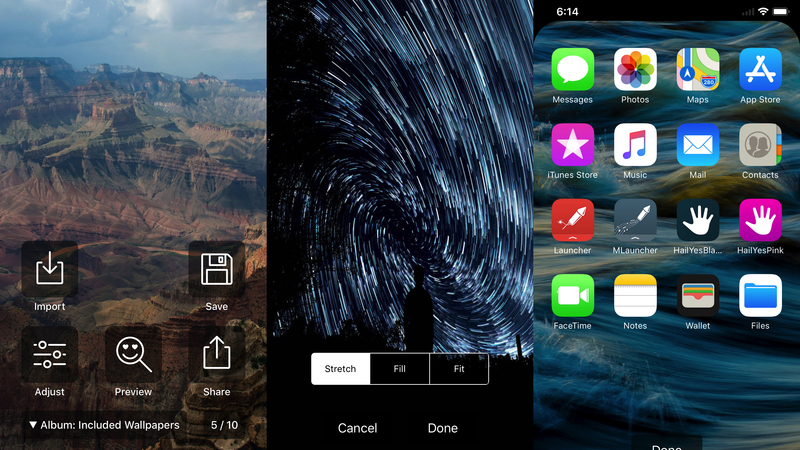 Unlike many wallpaper apps, WLPPR has been crafted with care and respect. Every image has a credit but also explanatory copy regarding what you’re looking at. You can bookmark favorites for later, apply a custom blur, and download imagery in standard or ‘parallax’ sizes. Neatly, there’s a preview mode, too. Tap the eye icon and you can load a realistic-looking home or lock screen to see how your wallpaper would look. Not convinced? Swipe to get the next one. Note that WLPPR is a freemium app, with IAP for extra photo sets; but for free you get dozens of high-quality pics – more than enough for most – and even more if you’re happy to spam your social media feed one time. 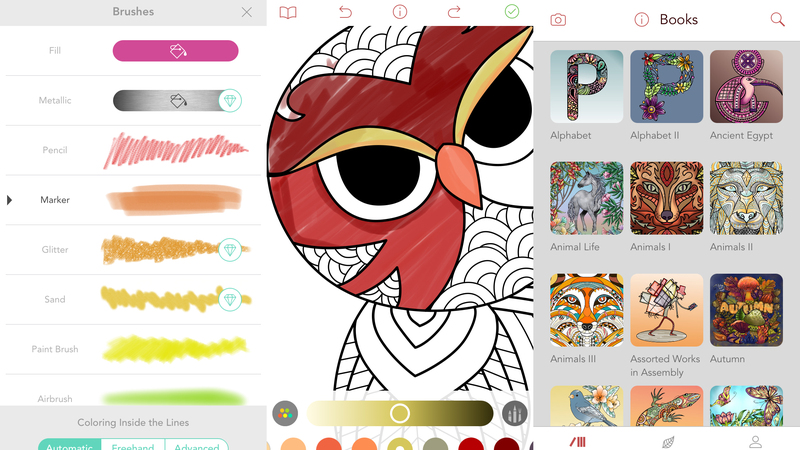 With its large display and the Apple Pencil, the iPad seems the natural home for a coloring app like Pigment. But if you fancy doing the odd bit of coloring-in when you need to relax, Pigment’s great to also have installed on the device you always have in your pocket. Even on the smaller screen, it excels. You get quick access to a set of top-notch coloring tools, and a range of intricate illustrations to work on. Sure, buy a subscription and you gain access to a much bigger range; but for free, you still get an awful lot. Amusingly, the app also offers options for staying inside the lines. By default, Pigment automatically detects what you’re trying to color and assists accordingly – but you can go fully manual if you wish! Unsurprisingly, Wikipedia is an app for browsing Wikipedia, the massive online encyclopedia that makes all paper-based equivalents green with envy. It’s the official app by Wikipedia and is easily the best free option, and only rivaled by one paid alternative we’re aware of (the rather fine V for Wikipedia). Wikipedia gets the basics right: an efficient, readable layout; fast access to your browsing history; a home page full of relevant and potentially new articles. But it’s all the small things that really count. Save an article for later and it’s also stored offline. Finding the text a bit small? You can resize it in two taps. Also, if you’ve a fairly new iPhone, 3D Touch is well-supported: home screen quick actions provide speedy access to search and random articles; and when reading in the app, the Peek gesture previews a link, and an upwards swipe displays a button you can tap to save it for later. Although most fans want to cheer on their soccer team by hollering from the stands or, second best, yelling at a TV in a pub, that&apos;s not always possible. When you&apos;re otherwise busy, Onefootball is a great means of keeping track of your favorites. The app&apos;s a cinch to set up. 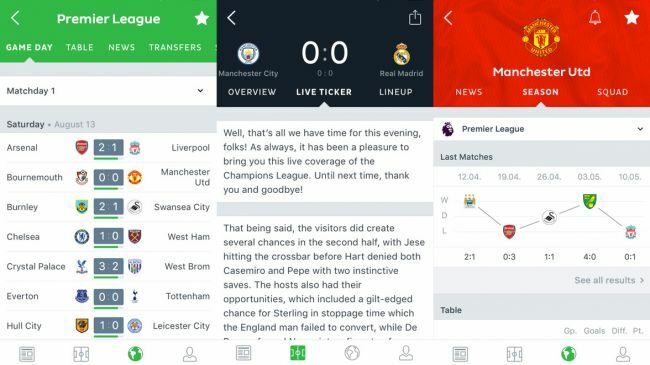 Choose your teams, allow Onefootball to send notifications, and then let the app work its magic. On match days, you&apos;ll be notified of every goal, which, depending on your team&apos;s fortunes, may make you thrill at or dread hearing the notification sound. If you at any point need a little more detail, venture into the app and you&apos;ll discover everything from live tickers to customized news feeds. eBay needs no introduction. But if you’ve just clambered free from a pile of boxes that fell on you in the mid–1990s, then: 1) probably tidy up a bit more often, and; 2) you can likely offload some of your junk on eBay. 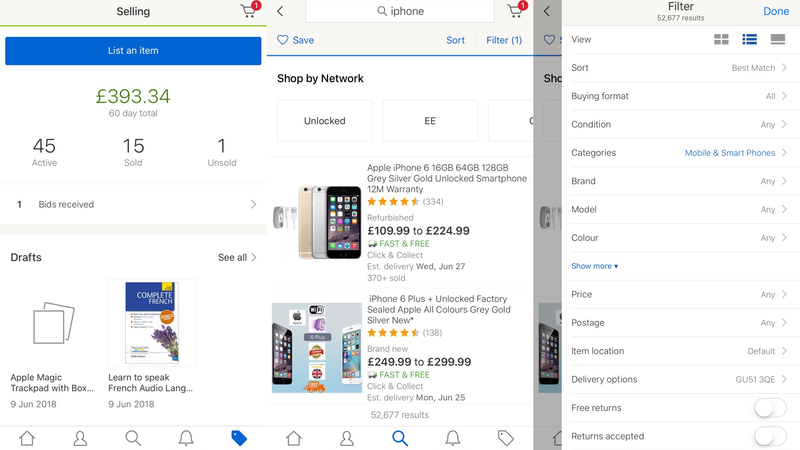 Although originally designed for the desktop, eBay’s a far more pleasant experience on the iPhone. You can zip through searches of its vast marketplace, and get notifications when auctions are nearly up or when you’re outbid. Selling’s a breeze, too. If your item has a barcode, scan it, take a photo of the item, and you’re good to go. Just be mindful that buying’s even easier than selling, and so don’t end up filling your home with more unnecessary tat the second you manage to offload some. Our favorite free iPhone apps for forming great habits, cooking, exercising and meditating. Simple Scales is a weight tracker that feels like something Steve Jobs would have approved of. Legend states in a meeting he drew a rectangle with a button labeled ‘BURN’ on a whiteboard, and told the iDVD team that’s what they were going to make. Simple Scales is similarly stripped back. The app syncs with HealthKit. On opening the app, you drag to input a new weight, and tap a button to save it. If HealthKit already has some of your other data, Simple Scales displays your BMI. If you have an Apple Watch, the process works pretty much identically, but from your wrist. This is almost extreme minimalism, but with zero fuss, no price tag and a nicely usable UI, it’s a weight-tracking app you’ll actually want to use. 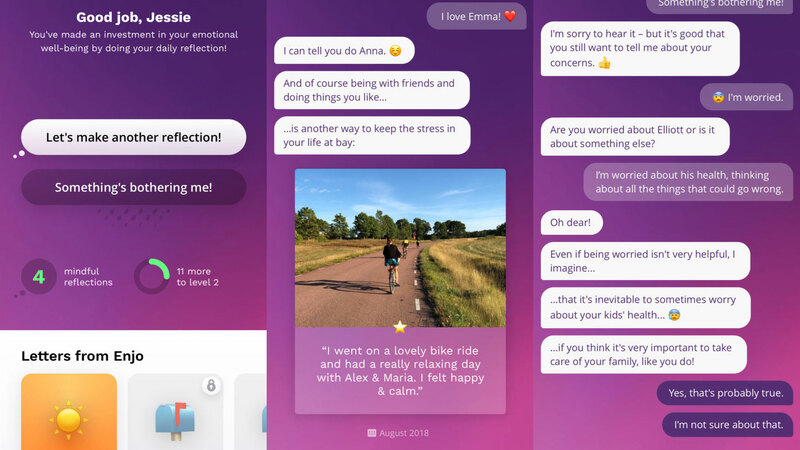 Enjo is a wellness app designed for adults, framed as a chat app. The idea is to help people remember good things whenever they are feeling down. The app starts off by engaging you in basic conversation. It will initially ask if you’ve got a partner, but will subsequently interrogate you about ways in which you keep stress at bay, and things specific family members did that you loved. You’ve probably by now clocked the mechanics: the app effectively builds a database of content it can serve to you in context when you’re feeling down. Naturally, this isn’t a replacement for therapy, but as a slice of mindful reflection, using a modern style of communication we all know so well these days, it hits the spot. Oak – Meditation & Breathing is a relaxation aid with no time for complexity and price tags – two things rivals often revel in, despite how they can (ironically) increase stress levels. Here, you choose between three options: meditate, breathe, and sleep. The three breathing exercises provide techniques for unwinding and boosting alertness. Meditation options cater for beginners and old-hands alike, with guided and unguided sessions across a range of durations. And if you can’t switch off in bed, a guided breathing session helps you fall asleep. Oak’s sense of elegance and focus is what sets it apart. This is an app that cuts to the chase, and immediately gets you on the path to a better you. And the Growth area helps keep you there, with tracking, stats, and achievements. 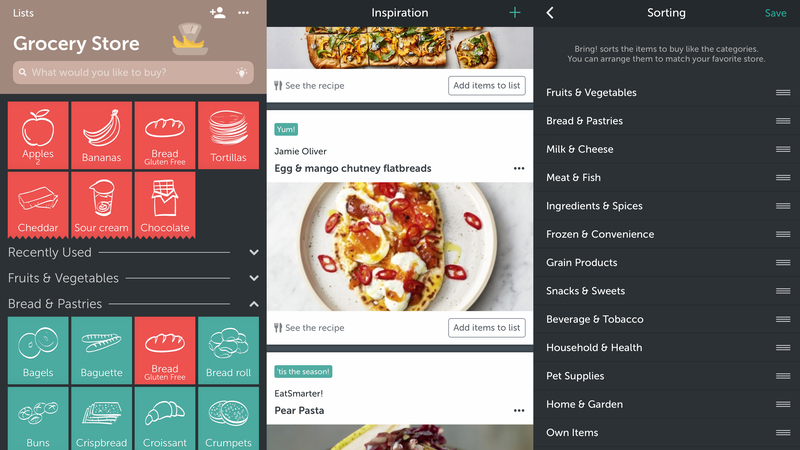 Tasty gives you a modern spin on cookery apps, through a splash of color, and a large dollop of video. 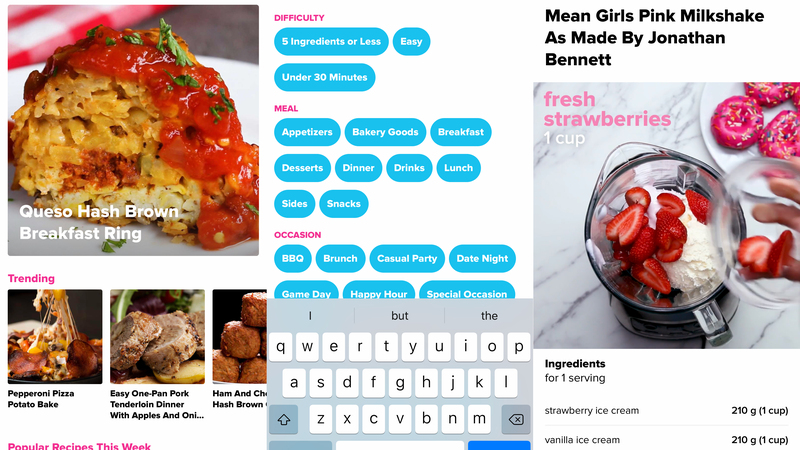 It starts off much like any other iPhone app: you can filter searches to specific dish types and dietary requirements; all the while, lush photography of tasty treats attempts to lure you in. But when you open a recipe page, Tasty dispenses with convention by immediately showing how the dish is made – in super-fast fashion. These tightly edited videos are like cookery TV with all the cruft removed, and they beat photographic stills because they show elements of technique. Smartly, although you can check out vanilla step-by-step instructions, it’s also possible to view individual steps alongside a relevant video clip. This should ensure you won’t go wrong and cook up a culinary catastrophe. 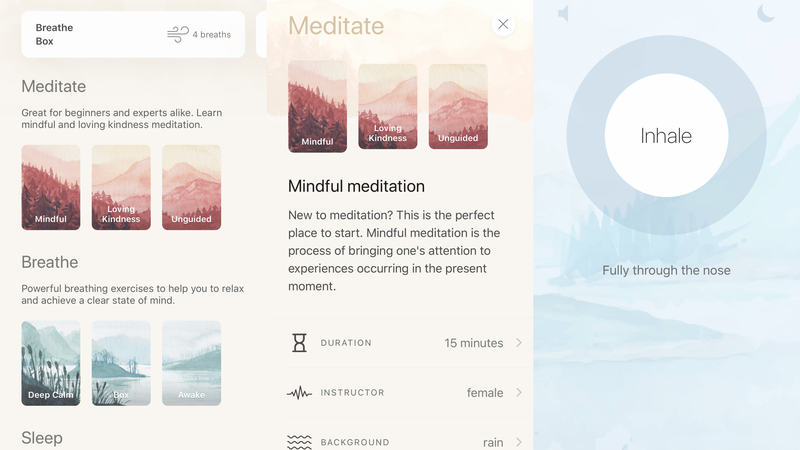 Smiling Mind is a straightforward, approachable meditation app that wants you to slow down a bit and embrace mindfulness. It starts off with a simple exercise that introduces the concept, before getting you started with short practice sessions. But if you’re already familiar with this kind of thing, you can jump right into a range of programs. As you use the app, it urges you to input how you feel, and tracks your progress over time. 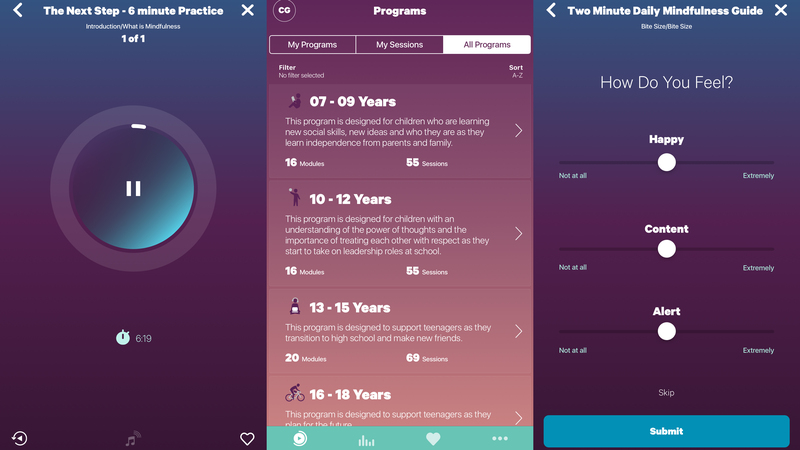 Also, along with providing programs for adults, the app offers exercises designed for children. Most importantly, though, everything about Smiling Mind feels calming, from the stylish interface to its lack of a price-tag. Whereas rivals go for wallet-thumping subscriptions, Smiling Mind is by a non-profit; it’s intent only on relieving you of stress rather than money. 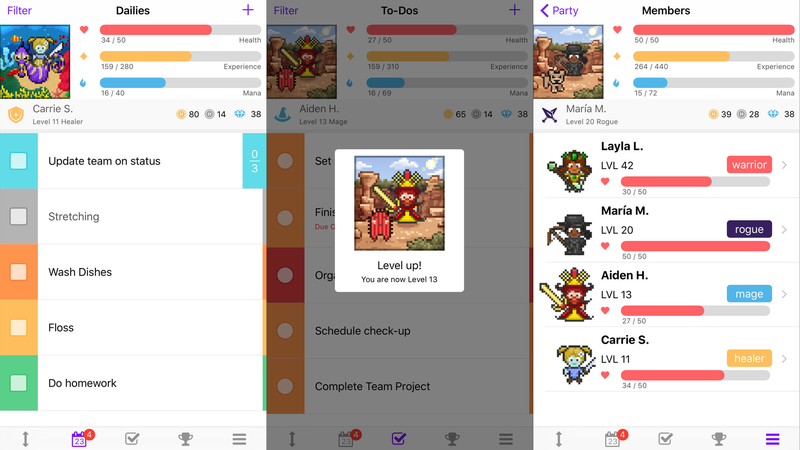 Habitica is a to-do list tracker. But before your eyes glaze over, Habitica does something very different in this particular app category, transforming boring lists into a game. The idea is that you input all the things you need to sort, including one-off items and daily goals. As you check off tasks, your little on-screen avatar gets powered-up, acquiring armor, pets, skills, and quests. Get some friends suitably invested and you can battle monsters alongside them – or just keep everyone honest. In short, this app makes productivity fun. And while there’s some satisfaction deleting an item from a boring bullet-point list, it’s a lot more interesting when taking the trash out results in your tiny hero beaming with delight at their shiny new sword. 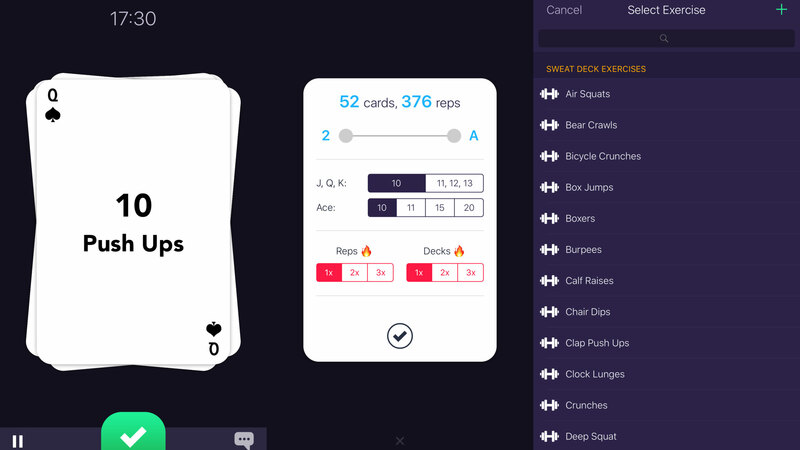 Sweat Deck reimagines exercise routines as a deck of cards. You assign exercises to certain suits, and lob in a couple of ‘jokers’ for good measure. The app then has you define how many cards/reps you want to try your hand at. The app’s semi-random nature keeps you on your toes (or hands and back, depending on the exercise). If you draw a three of spades, that might mean three squats; then a nine of diamonds could mean nine push-ups. It’s a novel interface that’s a bit different from other iPhone exercise apps. Sweat Deck could do with a way to switch cards other than tapping the screen (shouting perhaps), but you can always use prodding your iPhone as an excuse to rest for a few seconds, having suitably worked up a sweat by that point. 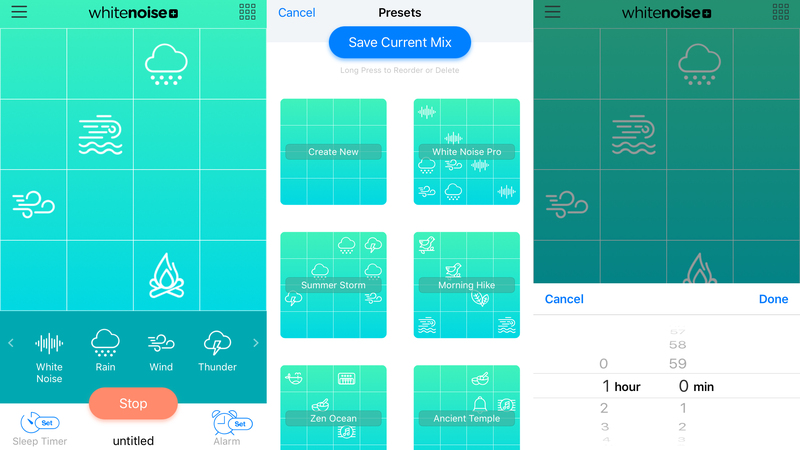 There are plenty of ambient noise products on the App Store, designed to help you relax, or to distract you from surrounding hubbub. 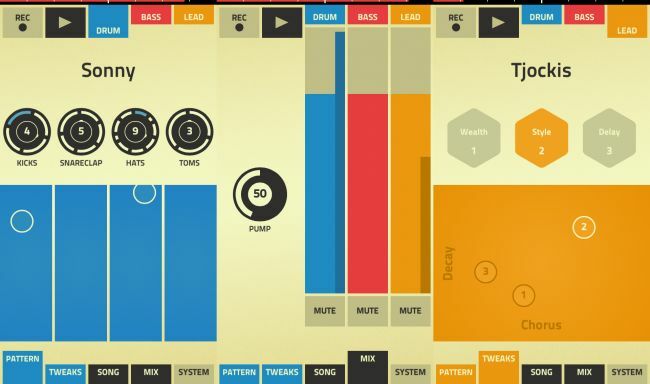 TaoMix 2 is one of the best, due to its gorgeous interface and the flexibility of the soundscapes you create. You start off with a blank canvas, to which you drag noises that are represented as neon discs. These can be recolored and resized, and positioned wherever you like on the screen. A circle is then placed to balance the mix, or flicked to meander about, so the various sounds ebb and flow over time. For free, you get eight sounds, can save custom mixes, and can even import your own recordings. Many dozens of additional sounds are available via various affordable IAP. If you need some ambient noise around you, White Noise+ proves an excellent app for blocking out distractions. The free version offers a small selection of sounds to soothe your soul – white noise, rain, wind, thunder, and wind chimes. To create some ambience, you simply drag one or more noise icons to an on-screen grid; the items towards the top play at a higher volume, and those towards the right become more complex in nature. Happen upon an especially pleasing combination and you’re able to save your mix for later use. The app smartly includes built-in mixes to provide a little inspiration – and to showcase a wider range of sounds that’s available via IAP. 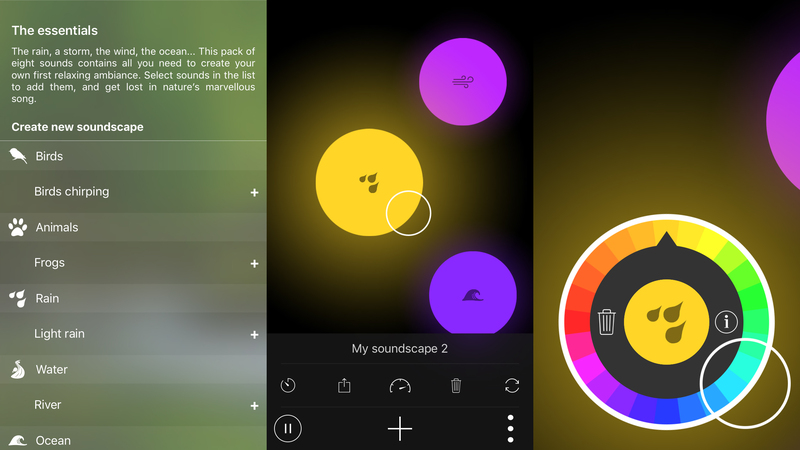 A single $2.99/£2.99/AU$4.49 purchase also removes the ad bar, unlocks a sleep timer, alarm, and dark mode, and allows you to fiddle with the 15 additional sounds – in both the bundled mixes and also your own creations. But whether you pay or not, the combination of excellent sounds and a modern, usable interface make White Noise+ a best-in-class product on the iPhone. You might not associate taking medication with a hip and cool iPhone, but technology can be a boon to anyone with such requirements. 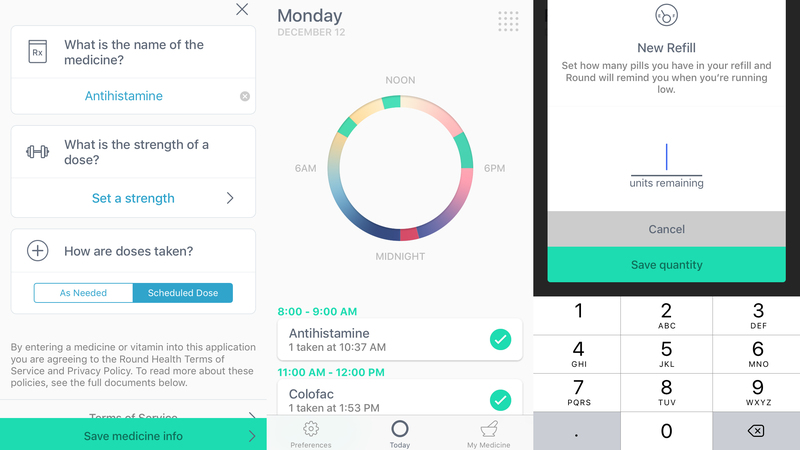 Round Health offers great pill tracking and dosage notifications – and it doesn’t do any harm that the app also happens to be gorgeous. It’s split into three sections: in My Medicine, you add medications, and for each you can define a name, strength, individual doses, and schedules based around reminder windows of up to three hours. In Today, you view and log the day’s medication. Flexible preferences enable you to set up cross-device sync, push notifications, and to export data – and reminding users to refill will be a real help too. That the app is free is generous, given the job it does – and how well it does it. Also, the system is flexible enough that Round Health might work as a reminders system for other repeating tasks, albeit one in which jobs are labelled as ‘taken’ rather than ‘done’! The science of sleep is something few people delve into. But you know some days that you wake up and feel awful, even if you think you&apos;ve had a decent night&apos;s sleep. Sleep Cycle might be able to tell you why. 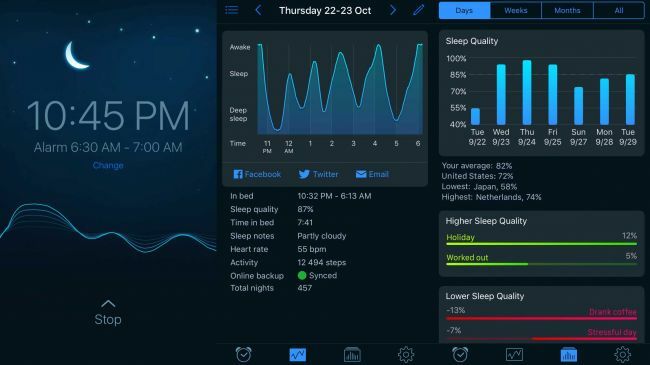 It analyses you while you sleep, using sound or motion, and provides detailed statistics when you wake. Additionally, it&apos;ll constantly figure out what phase of sleep you&apos;re in, attempting to wake you at the best possible time, in a gentle, pleasing manner. 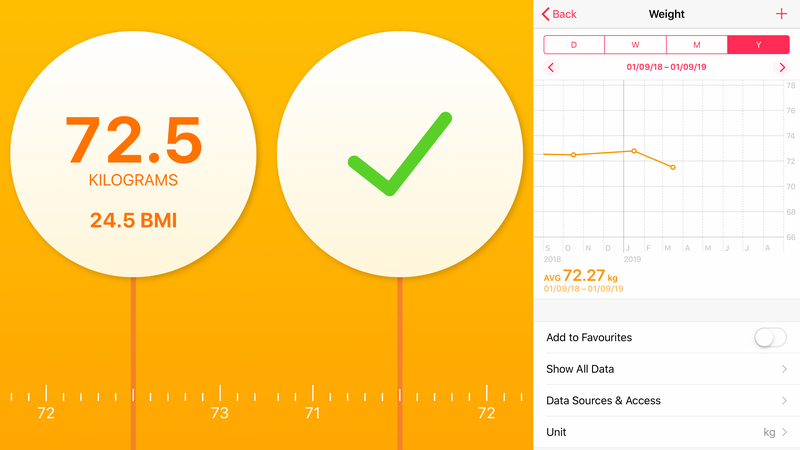 That probably all sounds a bit woo-woo, but here&apos;s the thing: this app actually works, from the graphing bits through to helping you feel refreshed and relaxed on waking up. Runkeeper has been around since the App Store’s earliest days, and has gradually transformed from a then-magical means of tracking runs using your iPhone’s GPS, to a combination of personal trainer and community, providing everything you need to keep yourself fit. 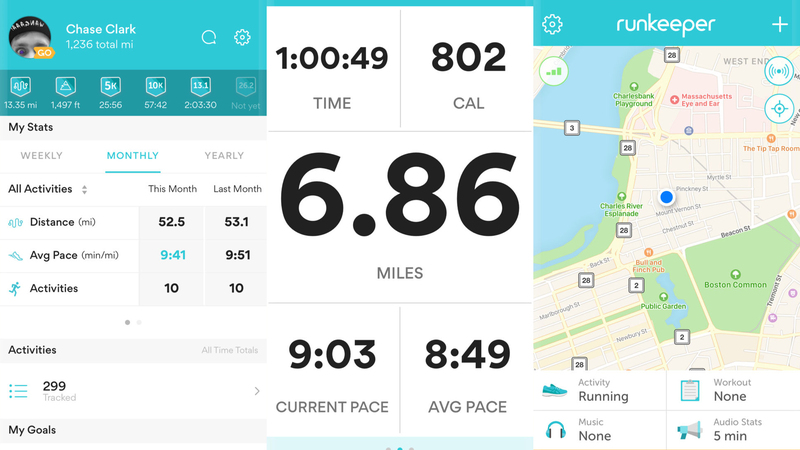 But it’s the other features that make Runkeeper really special: training plans; iTunes integration; custom challenges for friends; and a stopwatch mode for indoor activities and workouts. Unfortunately, it can’t actually do the exercise for you – so you’ll still have to work up a sweat yourself. Our favorite free iPhone interactive experiences and learning aids for toddlers and children. Tankee is a video-streaming platform designed for kids who want to watch videos about gaming. It strips out social networking and comments, and also – crucially – has a real person watch every video that’s made available. 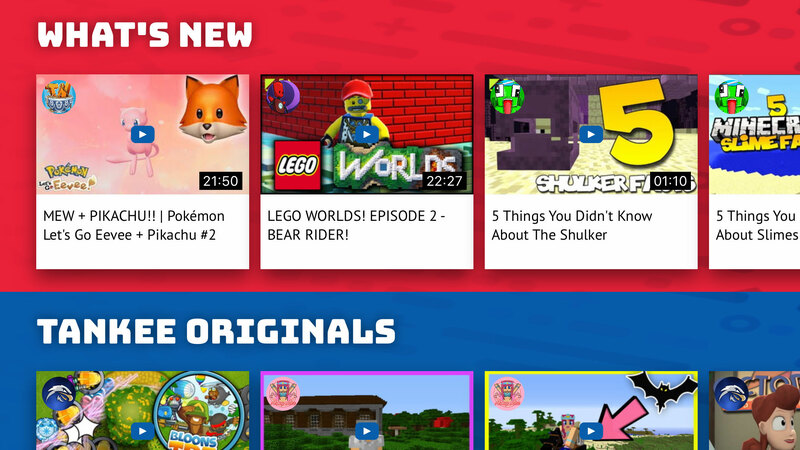 The downside is that this limits Tankee to a few hundred hours of content (although this is growing all the time); but you can at least know the videos will be age-appropriate, and algorithms won’t make horrific recommendations after your kid has delved into some Minecraft tips. Everything can be browsed for free, right from the off. Create an account and your child can choose an avatar, save favorites, follow channels, and hammer smiley buttons at lightning speed when they like a particularly good bit of a video. 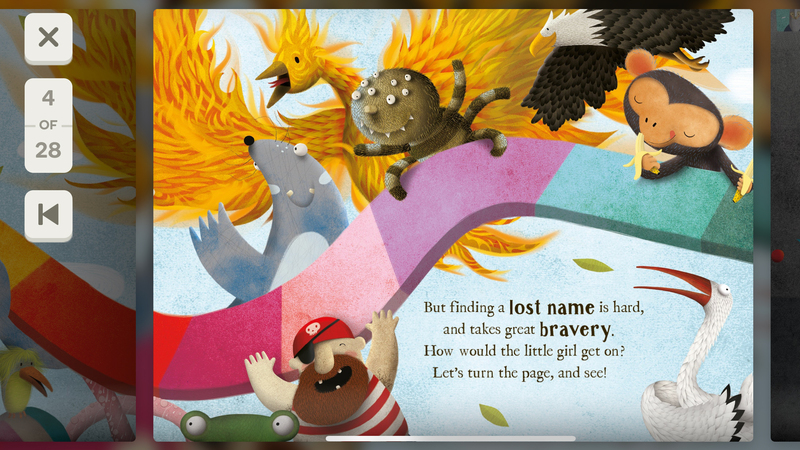 Wonderbly Story Time Books is an iPhone take on a personalized illustrated children’s book. The story centers on a child’s magical quest to find their forgotten name, and each letter has its own beautifully realized miniature adventure. In fact, each letter has more than one scene, which means there’s no duplication even if your kid has the unlikely name ‘Daaaaavid’. The only minor snag on iPhone is the text is sometimes a bit small. You can use a zoom gesture, but the second you let go, the page snaps back into place. Still, should you want to free your book from the confines of your iPhone, you can order a printed version. And should you want to revisit previous adventures in digital form, they remain stored inside the app. Peek-a-Zoo doesn’t look like much at first, given that every scene essentially features simplistic cartoon animals atop a flat slab of color, but you soon appreciate how much imagination has gone into this basic setup when you watch a child using the app. It’s all down to the questions, which challenge a toddler to find the right animal. They’ll be asked things like who’s dressed up (which character has the hat), who’s winking, or who’s trying to hide. That last one makes brilliant use of the minimalist graphics, ‘hiding’ an animal by matching its body to the game’s background. It’s all very sweet-natured, and has surprising range given how simple it is. 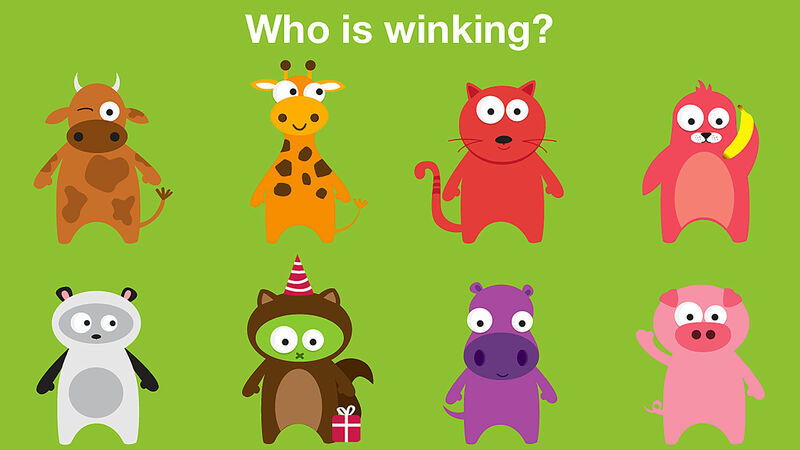 That’s something to appreciate – a free children’s app that’s free from cruft and ads. 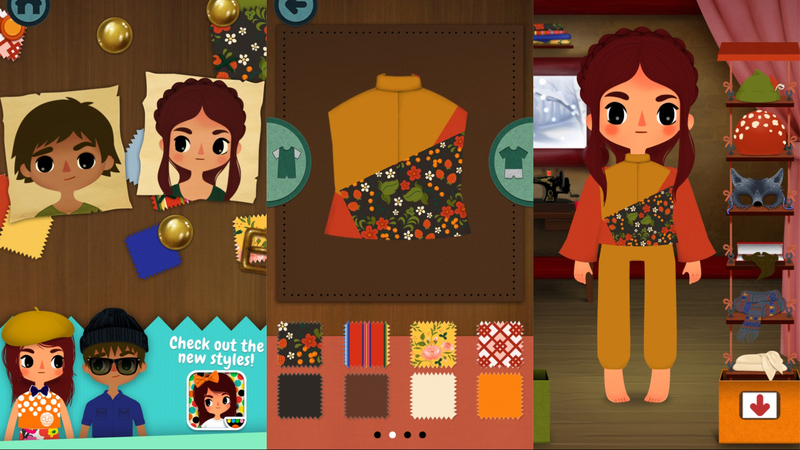 Toca Tailor Fairy Tales turns your child into a designer and stylist. On selecting a character to clothe, they can then drag and swipe to give them a beautiful new outfit. Well, ‘beautiful’ might be a stretch. The mix-and-match nature of the app offers equal potential for eye-searing garish fashion disasters. This is especially true when you delve into the materials section, zooming and rotating textures, or adding new ones by way of the camera. Garments can be adjusted in other ways, too – tap to switch to a different type, or drag to change something’s length. Last of all, there are accessories to give the model a perfect final touch – or a very silly hat. 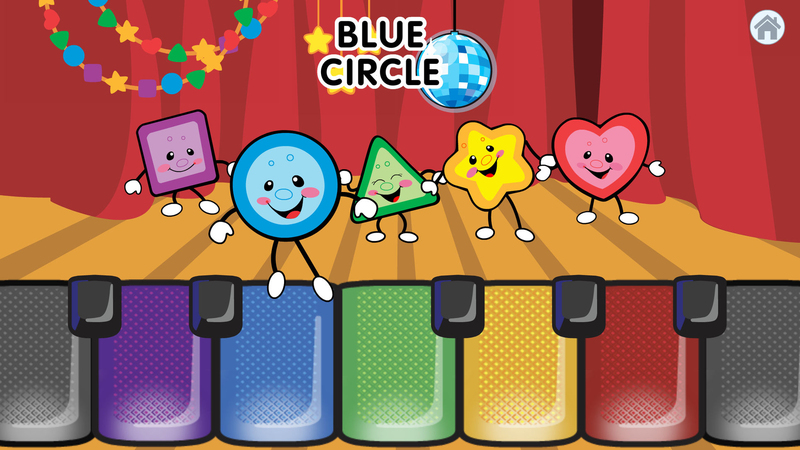 Laugh & Learn™ Shapes & Colors Music Show for Baby is an interactive experience designed for very young children. Level 1 should be approachable enough even for a six-month-old you’re brave enough to arm with your worryingly expensive iPhone; they can tilt and tap to make shapes appear and bounce around the screen. Level 2 is squarely designed at toddlers. The app chirps “Let’s put on a show!” as shapes dance and jump about on the screen. This is augmented by jaunty earworms that will burrow into your skull, while your tiny human makes their own live remix by prodding at a colorful piano keyboard. It’ll drive you bonkers, but the smile on that little face will be worth it. Probably. 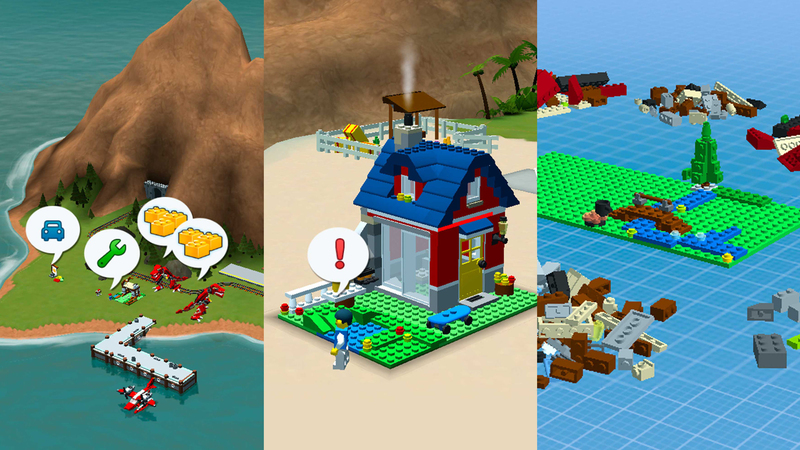 Lego Creator Islands might seem like an odd choice for inclusion here, since parents would most likely sooner see their children playing with plastic bricks rather than virtual ones on an iPhone. But when the real thing isn’t available, this official game does the business. It all takes place on the titular islands, which you explore to collect bricks that act as a kind of in-game currency. These can then be used to acquire Lego sets that are constructed with a few deft taps. The selection is fairly small, but even so you can over time build a rather nice set of islands, featuring houses, roaming animals and dinosaurs, and vehicles blazing about the place. Also, there’s no chance of getting a plastic brick embedded in your foot. Green Riding Hood subverts a much-loved fairy tale, re-imagining Grandma as a hip yoga teacher, and having the Big Bad Wolf gradually learn how tasty healthy food is. Which might all sound a bit like brainwashing for tiny people if the story bit wasn’t so well designed. 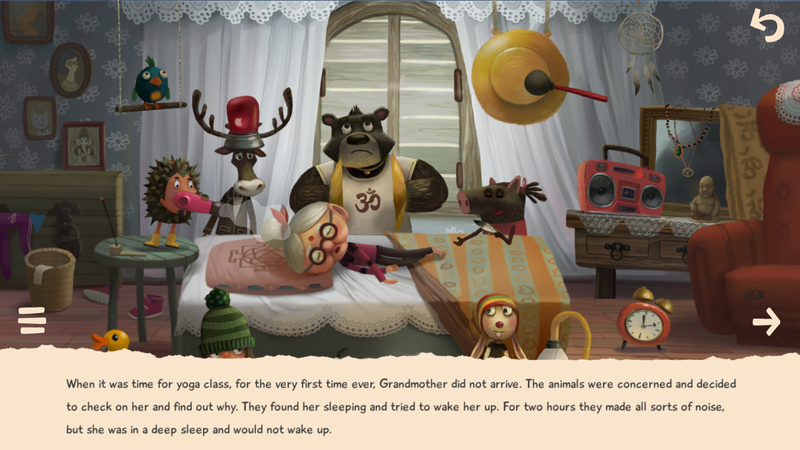 Each little scene in the book is interactive, so you can tap animals to make them exercise, have the wolf angrily lob a bone into the forest, or – our favorite – fashion a cacophony as the animals try to wake a dozing granny with whatever objects they have to hand. Beyond the book, you get some recipes and stickers for free. If all that takes your fancy, IAPs unlock exercise and dance routines – but, really, just the fairy tale bit alone makes this one very much worth a download. Our favorite free iPhone apps for playing songs, listening to podcasts, making music and being a virtual DJ. 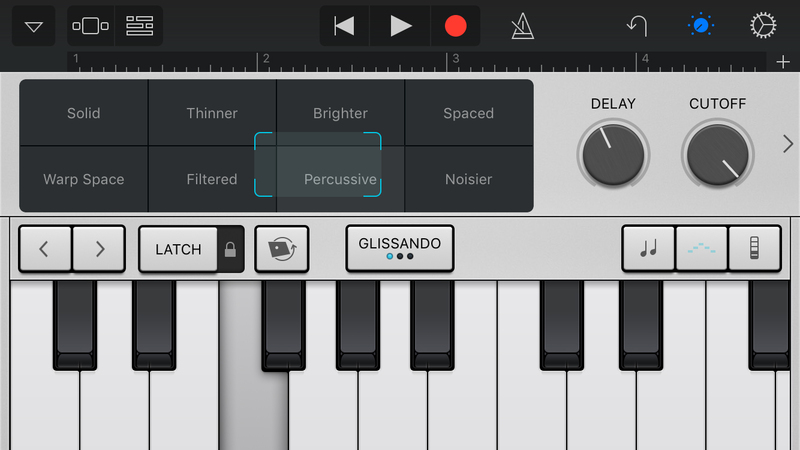 AudioKit Synth One Synthesizer is perhaps the most audacious synth you’re ever going to see on iPhone. That’s not because it’s full of knobs to twiddle, and amazing sounds – although Synth One is blessed with an abundance of both; it’s because you get all of this entirely for free. There are no catches, and no ads. This is a fully open-source project that can match the power, quality, and clout of the most pro-level software found on iOS. This means if you’re a pro, you can delve into fashioning presets, working with MIDI, wiring up the synth via IAA or AudioBus, and more besides. 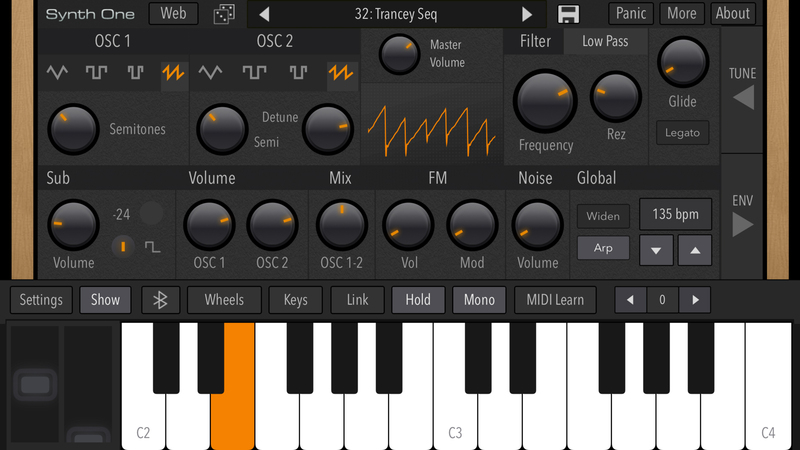 If you merely like making a noise, you get a superb iOS synth for no outlay whatsoever. The word ‘bargain’ doesn’t really cover it. 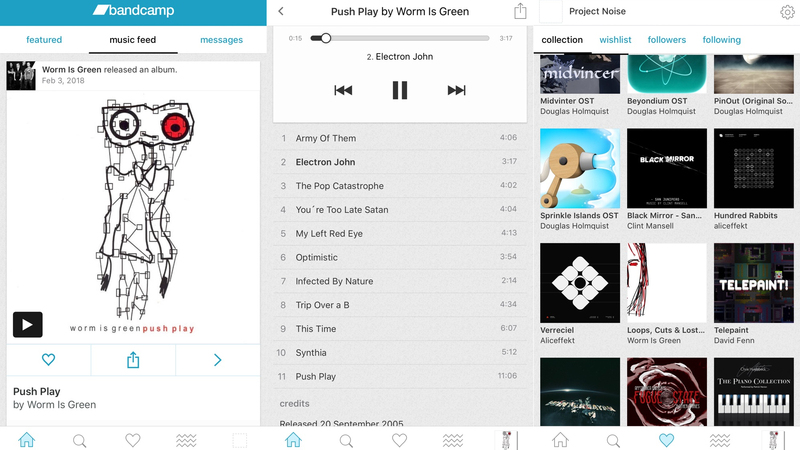 djay is an app for budding DJs who want to spin some virtual vinyl. Launch the app and you can convince yourself that you’re a perfect mix of Martin Garrix and David Guetta, slamming amazing tunes into your ears, while fiddling with a mixer, looping, EQ, filters and effects. Alternatively, you can just fire up the app’s Automix feature and let it get on with all the tricky stuff. With Spotify and iTunes integration, it’s not hard to find things to play, although the interface on iPhone is a touch fiddly for full-on DJ work (rather than entertainment for a wannabe). On that basis, we’d exercise caution before grabbing the feature-rich pro-subscription. 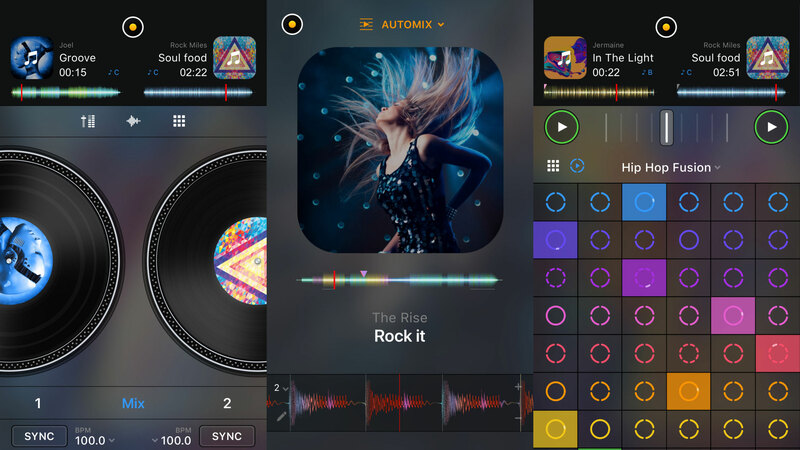 That said, if you’ve got an external DJ controller, djay for iPhone can feasibly become a vital – and portable – toolkit component even for the pros. Wilson FM reasons there an awful lot of podcasts, and it’s tricky to find great new ones to listen to. It therefore packages hand-picked individual episodes in the format of a magazine. A new issue of Wilson FM arrives every week, and each one is designed to be thematically and culturally relevant. It’s also a handy way of branching out from your usual listening bubble, and delving into the likes of entertaining science, the meaning of words, and cracking cultural mysteries. The player itself is basic, and not a patch on the likes of Overcast. But that’s not the point of Wilson FM. It’s here to help you discover new things, and if you chance across a really great show, you can always copy its link and subscribe to it elsewhere. Beatwave wants to simplify the process of creating music. You tap notes on to a grid, which explode in color like digital fireworks when the playhead hits them. You can keep adjusting your loop live, or add depth by overlaying loops of different sounds, including drums. 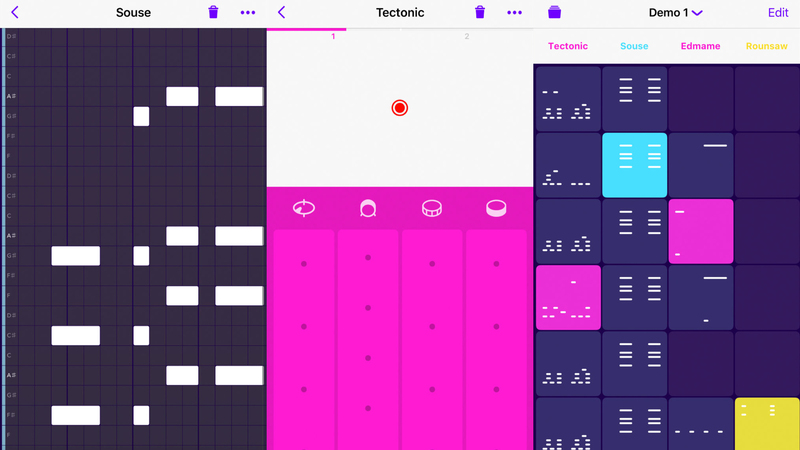 For an app that looks so simple, and with vibrant blasts of color not usually associated with music creation tools, there’s surprising depth here, with sliders to tweak sounds, drum generators, and auto-chords. Veterans, though, may miss the original’s more approachable square grid play surface, which echoed Yamaha’s Tenori-on. The only other downside is the sounds you get being a touch limited. Still, there’s enough range for what’s ultimately a musical sketchpad; and if you want more, the ‘pro’ IAP US$9.99/£9.99/AU$14.99 adds several extra sets. Yousician helps you to master a musical instrument or sing, but without that feeling like a chore. To that end, it often resembles a video game. When you’re learning piano, the interface depicts scores and keyboards with bright colors to help guide your eyes and finger, but the app really comes alive when you’re learning guitar. It turns into something like Guitar Hero, only you’re using a real guitar and the app is cunningly teaching you how to play. Things start with the basics, but before long you’re strumming and picking with the best of them. The only big limit in the free version is daily play time. Grab a subscription if you fancy learning more rapidly. Bandcamp might seem superfluous in a world of Apple Music and Spotify, but for anyone who enjoys venturing further afield to find new music, it’s a must. The service is chock full of indie artists, whose music you can delve into by way of the Bandcamp Weekly radio show, or by browsing the app’s news feeds. Most albums enable you to preview a few tracks in their entirety, and some are entirely free to play, forever. If you want to go old-school and actually buy music, the Bandcamp website is a good bet. Purchases can be downloaded in a range of formats; and when you only have your iPhone to hand, you can stream what you’ve bought and watch as your personal music feed fills with related tracks you might also enjoy. The iPhone version of GarageBand has always been ambitious. Aiming at newcomers and professionals alike, its feature set includes smart instruments that always keep you in key, multitrack recording/editing functionality, a loops player, and superb guitar amps. But 2017’s major update takes things much further, with new synth Alchemy improving the app’s previously slightly ropey sound set. Smart piano strips have been expanded to all keyboard instruments, helping anyone to play perfect melodies. And Audio Unit support exists to load third-party synths directly inside of GarageBand, similar to how plug-ins work on desktop music-making apps. Because of these things, GarageBand is now even more suited to musicians of all skill levels – although be aware on smaller screens that the app can be a touch fiddly, what with there being so much going on. 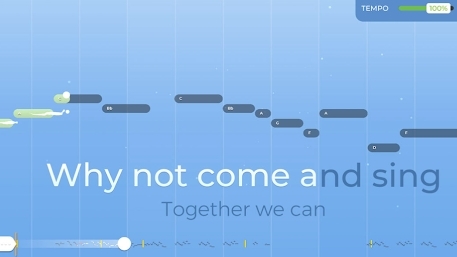 Plenty of apps claim they can get you making music in seconds, but Figure really means it. The app&apos;s heritage helps, as it comes from Propellerhead Software, creators of the legendary Reason and ReBirth. In Figure, though, working on loops and beats is stripped right back from what you&apos;d find in those complex PC apps; instead, you tap out drums, and slide your finger around to fashion monster bass and playful leads. Sounds can be tweaked or swapped out entirely at any point. Once you&apos;re done, finished tracks can be uploaded and shared online. For serious musicians, there&apos;s even Audiobus support. Sometimes with apps, it&apos;s the seemingly little things that make a big difference. 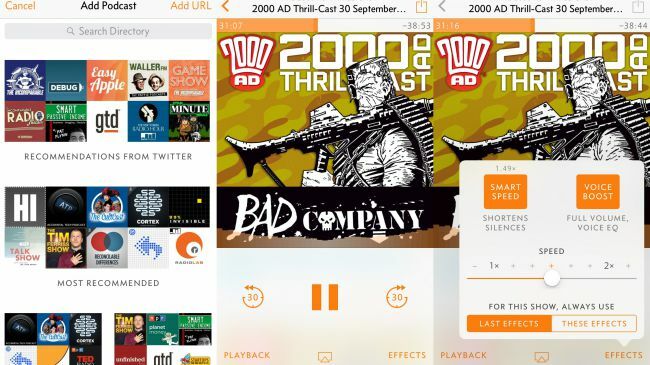 With Overcast, for example, you get a perfectly decent podcast app that does everything you&apos;d expect: podcast subscriptions; playback via downloads or streaming; a robust search for new shows. But where Overcast excels is in attempting to save you time and improve your listening experience. Effects (which can be assigned per-podcast) provide the smartest playback speed-up we&apos;ve heard, voice boost for improving the clarity of talky shows, and smart speed. 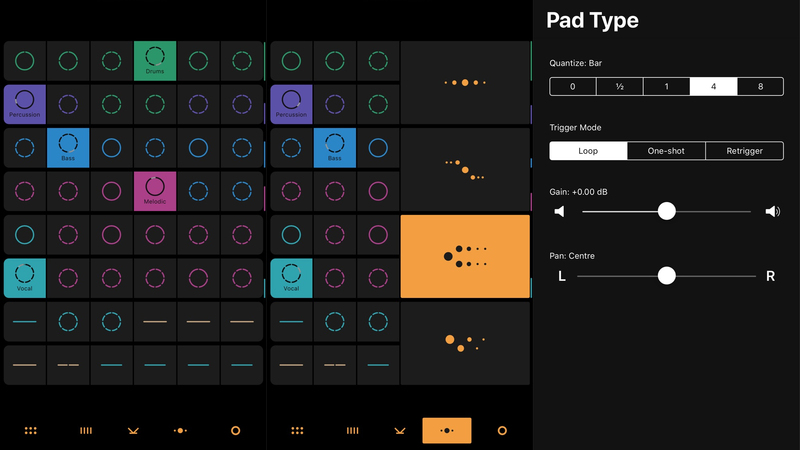 On the iPad, Novation Launchpad is one of the best music apps suitable for absolutely anyone. You get a bunch of pads, and tap them to trigger audio loops, which always sound great regardless of the combinations used. This isn&apos;t making music per se, but you can get up a good head of steam while imagining yourself as a futuristic combination of electronic musician, DJ and mix genius. On iPhone, it shouldn&apos;t really work, the smaller screen not being as suited to tapping away at dozens of pads. But smart design from Novation proves otherwise. 48 trigger pads are placed front and centre, and are just big enough to accurately hit unless you&apos;ve the most sausagey of sausage thumbs. Effects lurk at the foot of the screen — tap one and a performance space slides in, covering half the screen, ready for you to stutter and filter your masterpiece. As on the iPad, you can also record a live mix, which can be played back, shared and exported. This is a really great feature, adding optional permanence to your tapping exploits. Apple&apos;s Music Memos is all about getting music ideas down — fast. You launch the app, hit record, play your guitar or piano, and your riff is safely recorded, rather than vanishing from your head the moment you see something vaguely interesting outside. Smartly, the app provides additional toys to experiment with. There&apos;s a tuner, and during playback, you can add automated electronic bass and drumming. The virtual instruments attempt to match tempo and energy with whatever you recorded (and with some success, although more complex inputs can confuse this feature to an amusing degree). Music Memos also tries to transcribe the chords being played; its accuracy is questionable beyond the basics, but not bad as a trigger when you later want to learn how to play your own spark of inspiration. Usefully, you can fling recordings at GarageBand and Logic (bass and drums going along for the ride as separate tracks). 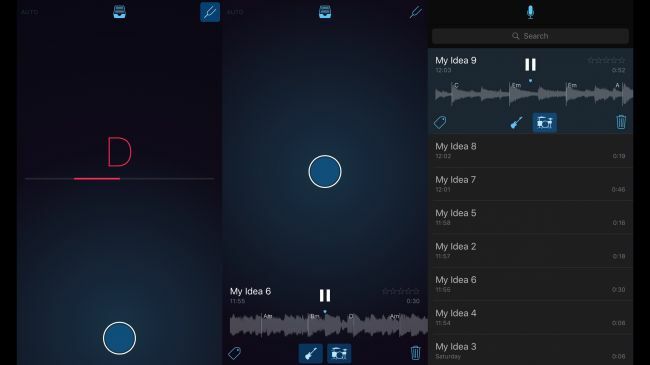 Less usefully, you can sing into the app, and still add bass, drums and chord transcription, for some kind of madcap tech-based cacophony of awfulness that we felt entirely compelled to try in the name of a thorough review. Expect our effort to (not) trouble the charts shortly. 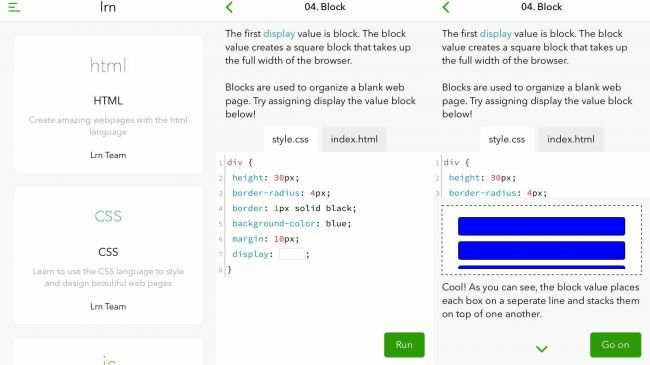 Our favorite free iPhone web browsers, calculators, password security tools and writing apps. Otter bills itself as the place where conversations live. Which is a lofty way of saying it’s a voice memos app. That might not sound exciting, but Otter has fantastic features for anyone in the habit of jabbering at their phone. It auto-transcribes in an intelligent manner, automatically including punctuation. You get ten hours per month for free, which seems generous. Additionally, notes are timestamped, can have inline images and highlights, and automatically get summary keywords, so you can check subjects at a glance. There’s cloud data sync, conversation sharing, and Face ID/Touch ID security, too. Although there’s a paid plan, that’s only needed if you want up to 100 transcription hours per month or bulk file export. For most people, though, looking for a zero-hassle memos app with transcription, Otter’s free incarnation can’t be beaten. LastPass has a lot in common with Apple’s iCloud Keychain, which comes baked into your iPhone. You get a place in which to securely store website login/password details and payment information. This integrates with Safari, and also – from iOS 12 onwards – with third-party app sign-in screens. The main advantage of LastPass over Apple’s solution is that it’s available for Android and Windows, meaning you can use your passwords on whatever system you wish. But also it includes secure notes, and custom form filling options, which prove handy as well. 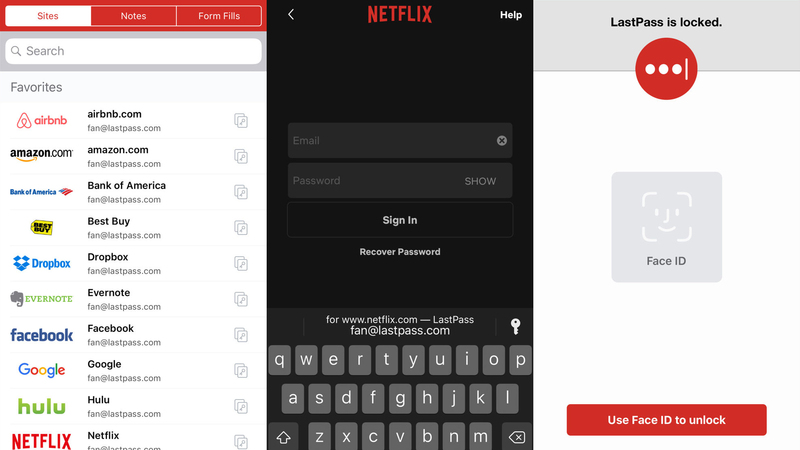 Because LastPass can be used alongside (rather than instead of) iCloud Keychain, it’s worth a look regardless, not least given that its editing and browsing interface far betters Apple’s. And although there’s a premium tier, the free version will be enough for most. Drafts 5 describes itself as the place “where text starts” on your iPhone. That’s quite the claim, but the app really does excel if you work with words. The efficient interface makes it a breeze to work on structured text with Markdown, glancing at a live word count as you go. A customizable keyboard row provides speedy access to Markdown tools – or anything else you fancy stashing there for easy access. Once you’re done, you can keep your documents in Drafts, where they remain easily searchable, and can even be added to from the Apple Watch app. Or you can send them elsewhere by utilizing a range of actions. 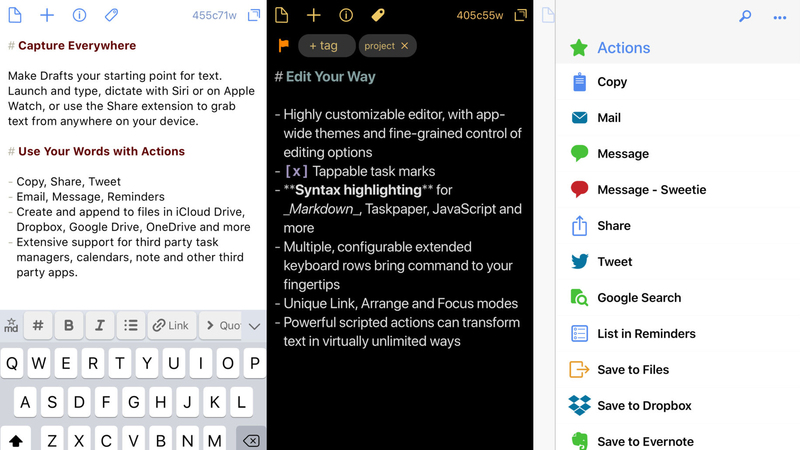 Splash out on a subscription and you unlock even more power; but for free, Drafts 5 is an astonishing bargain for anyone in the market for a top-notch iPhone text editor. DuckDuckGo Privacy Browser is a web browser that reasons privacy shouldn’t be an optional extra. Instead, it doubles down on giving you control over your personal information as you browse the web, regardless of what you’re doing. By default, tracker networks are blocked, encryption is forced whenever it’s available, and searches use DuckDuckGo, which never tracks you. Should you finish doing something confidential, you can prod a single button to erase your entire browsing history – easy. The browser can also give you details on any site’s privacy measures, and show improvements it’s made on your behalf. DuckDuckGo Privacy Browser’s simplicity and standalone nature mean it might not be a total replacement for Safari, but it’s worth installing as a back-up browser – or even just if you fancy checking out the privacy credentials of sites you enjoy using. 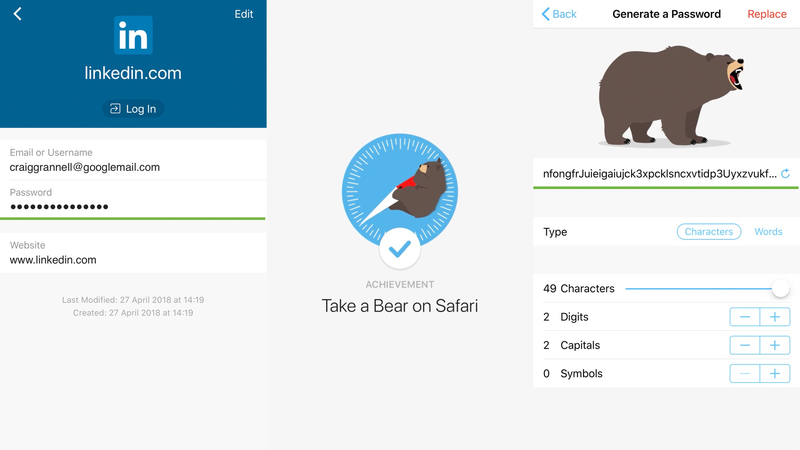 RememBear puts a friendly, furry face on password management. Getting started is simple, as is inputting website usernames and passwords. Everything you enter is fully secured behind a master password – or Touch ID if you have a compatible iPhone. The app can integrate with Safari for iPhone, but has its own built-in browser too, should you want to keep certain passwords and activity away from prying eyes. There’s also cross-device sync so you can use your logins across Macs, PCs, and Android devices. There’s less scope here than in the likes of 1Password – RememBear is only for website logins and payment cards, not things like notes and servers. Still, its focus and friendliness make it a great choice if you’re not already using a password manager – or if you are, but fancy something simpler. 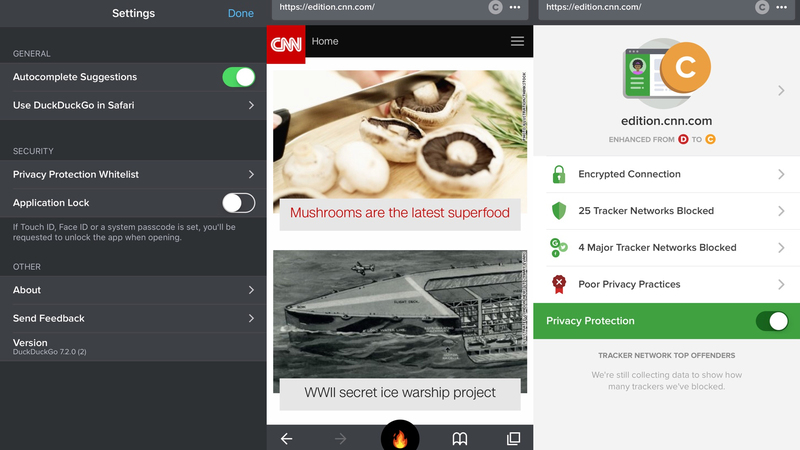 Cake Browser is a mobile-centric web browser that wants you to skip right to dessert. 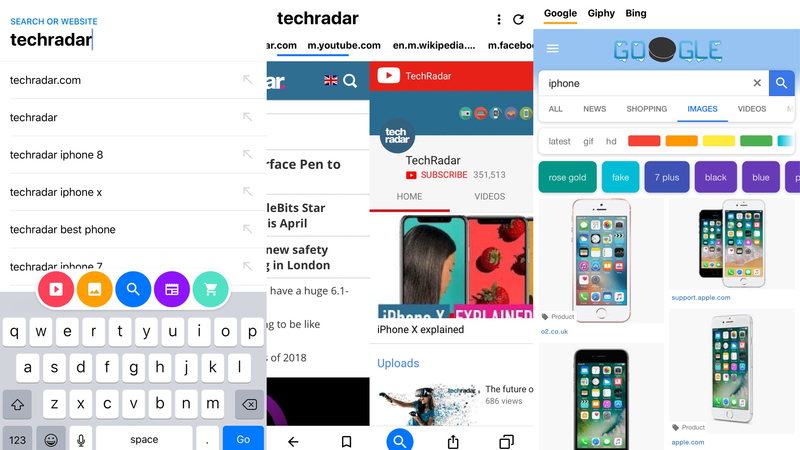 Instead of presenting you with a list of search results, Cake immediately displays what it thinks is the most relevant page, while others load in background tabs. You then swipe between them (though you can still access a traditional results list by swiping from the left). There are great ideas in Cake, not least the buttons that trigger searches specifically for video, images, news, and shopping. The downside is that the search engines and sites Cake uses aren’t configurable, and the results it provides aren’t always what you want. Even so, that sense of surprise, and not always heading to the same old places, makes Cake worth a look – even if you stick to Safari for the bulk of your browsing. Pages is a fully fledged and fully free word processor for your iPhone. Word processing might not be top of your list of iPhone-related tasks, but this great app might just change your mind. Pages includes a wide range of templates, such as reports, letters, cards and posters. 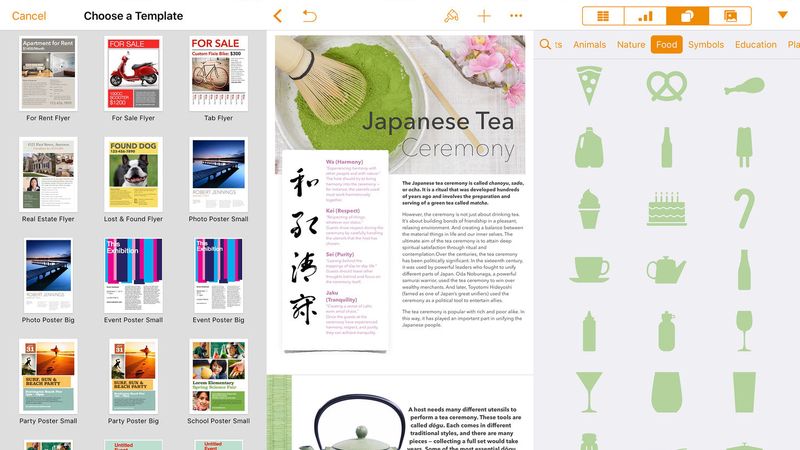 Although you probably won’t want to create and edit an entire magazine on your smartphone, Pages is user-friendly, with an efficient interface that’s suitable for banging out a first draft of a letter, leaflet or poster while you’re on the train. Thanks to iCloud sync, whatever you create in Pages can be opened on a Mac or iPad running the app. If you’re resolutely iPhone-only, you can export your work in a range of formats, including PDF and Microsoft Word. If you’re really rocking it old-school, you can even send it to an AirPrint printer. PCalc Lite is a version of leading iOS calculator PCalc, aimed at people who aren’t keen on spending money. In terms of functionality, it’s more stripped back than its paid sibling, but the app’s guts are identical. 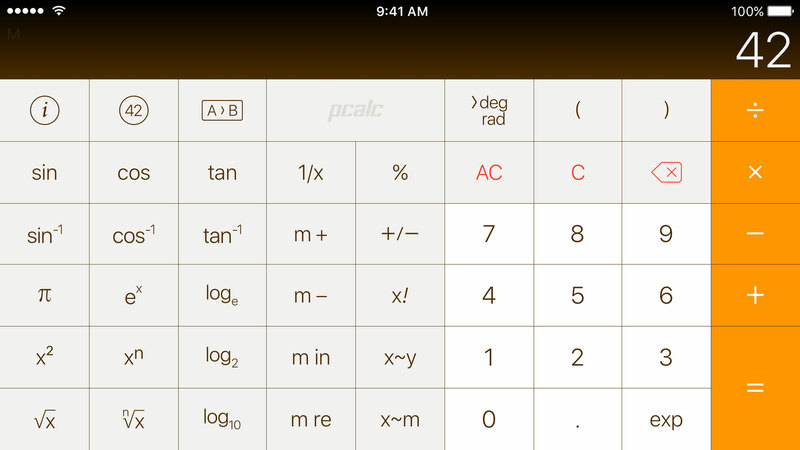 What this means is PCalc Lite is undoubtedly the best free traditional calculator for iPhone. It’s fast, responsive, and friendly, and bundles a small set of useful conversions for length, speed, temperature, volume, and weight. If you want to bolt on something from the paid version, IAPs exist, such as for multi-line support, or extra conversion options. When iOS 11 arrived, Apple’s built-in calculator proved buggy, leading to people scrabbling around for an alternative. With PCalc Lite installed, that need never happen to you. Documents by Readdle is a file manager, document reader and PDF editor. From a documents standpoint, the app wasn’t made redundant by Apple’s Files; rather, it nicely supplements it. 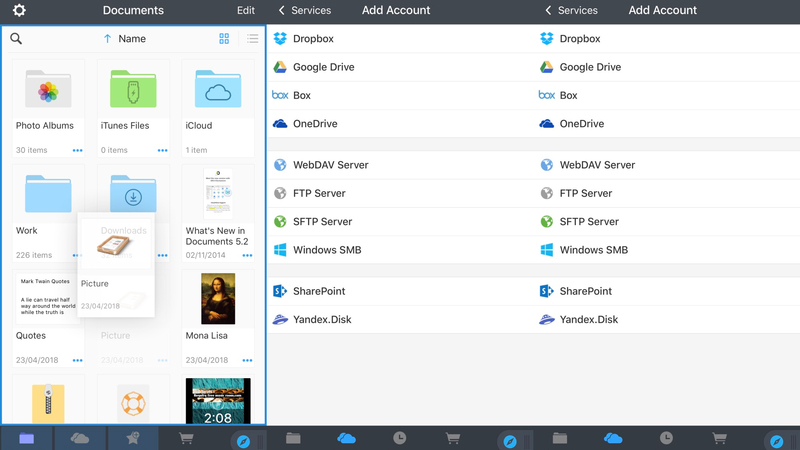 This is because Readdle’s app can connect to remote servers, such as WebDAV, SFTP and shared network drives. In-app document management is sleek and simple, and support for Locations in Files means you can via Apple’s app access whatever you’ve stored in Readdle’s. From a productivity standpoint, Documents is handy as a reader for all kinds of files, like Microsoft Office documents, images, movies, and PDFs. With the last of those, you can also search and annotate, making this app an ideal addition to your freebie iPhone toolkit when you need to do work on the go. Scanbot Scanner App is, suitably, a scanner for your iPhone. This might seem unnecessary now Apple’s Notes app includes scanning functionality; and, indeed, Scanbot and Notes do have some overlap. Even so, we reckon Scanbot is very much worth a download. First and foremost, having a separate scanning app is more efficient. Rather than fiddling around setting up a new scan in Notes, embedding imagery, and then sharing your scans, Scanbot has a sleeker user flow. 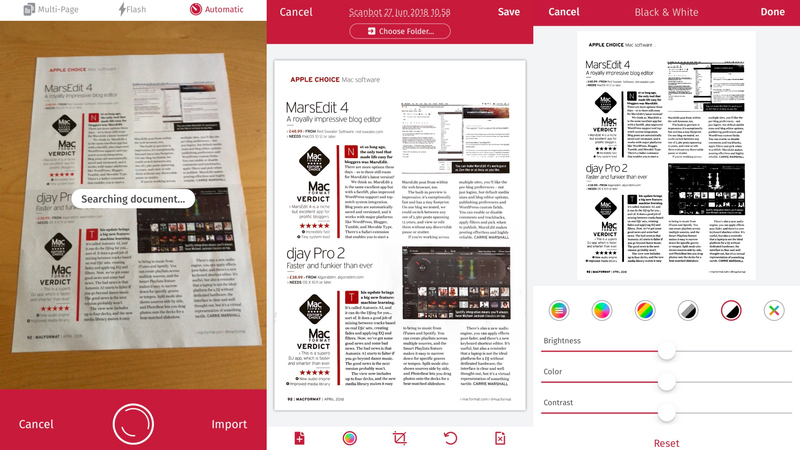 It also seems faster than Apple’s app when it comes to scanning – for which you can scan single or multi-page documents, and then apply effects to the end results. Scanbot also has an upgrade path, for those who want more. Pay and you gain access to automatic cloud uploads, PDF editing, document encryption, and OCR. But even for free, Scanbot deserves a place on your iPhone. 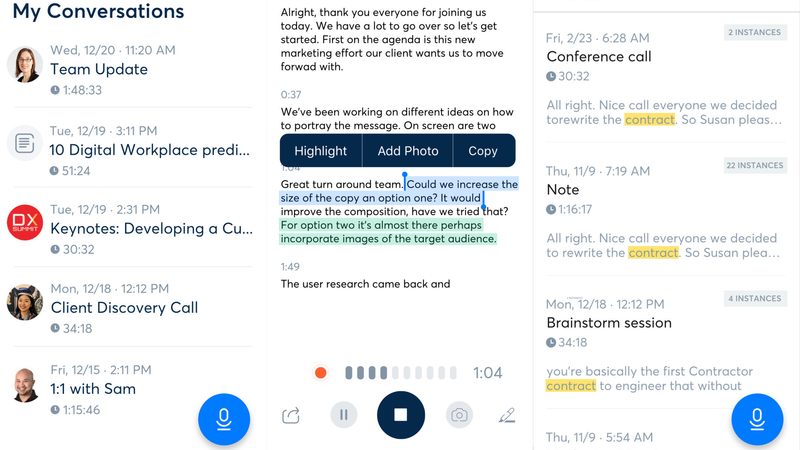 Our favorite free iPhone apps for being more productive with reminders, to-do lists, flash cards, timers, keyboards, conversion aids and automation. Bring! offers a new spin on shared shopping lists. 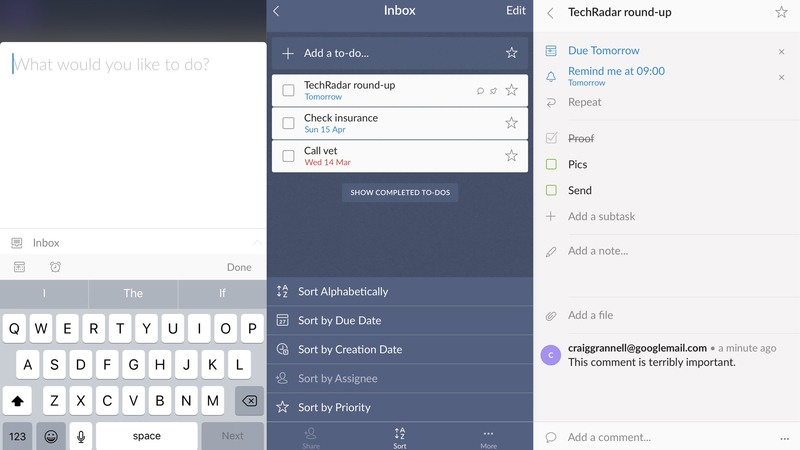 Although you can create a straightforward shared text-based list in Reminders, Bring! opts for large colored buttons adorned with icons. Not only are these easier to spot when you’re in a busy supermarket with a basket on one arm and a toddler on the other, they’re also a mite simpler to tap. Beyond this, there’s all kinds of smart stuff going on. Color-coded rings on items change from green to orange to red when the product is getting closer to running out. For items where you want something very specific, you can add notes and a photo. And when you fancy letting everyone know you’ve made changes to a list shared with many people (for example, in an office), ready-made messages can be sent, saving you the hassle of crafting one yourself. 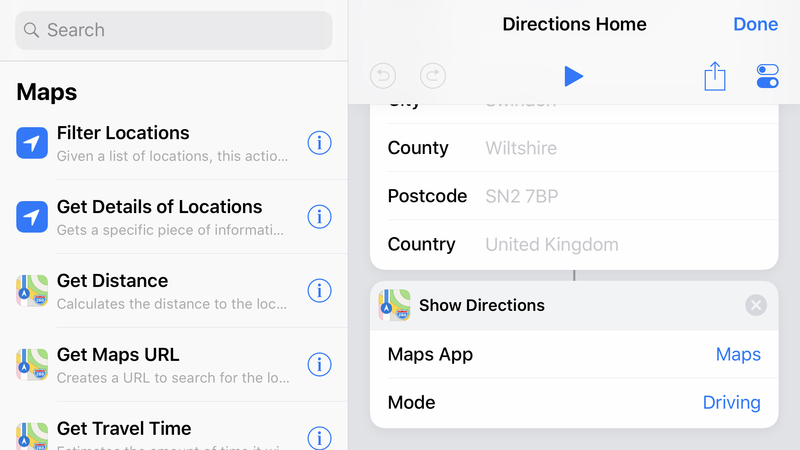 Shortcuts is Apple’s redesign of the well-regarded Workflow app, which aims to streamline your day by automating common tasks. Apps of this ilk have a history of being geeky and impenetrable, but Shortcuts is the friendly face of automation. In the Gallery view are dozens of pre-made workflows to download, which perform actions like calculating tips, figuring out how long it’ll be before you’re home, and logging aspects of your routine. Actions can be added to your Home screen as pseudo-apps, and triggered from Today view or by using Siri voice commands. For a fully custom experience, there’s an editing view to dig into. You can tweak existing downloads, or start with a blank canvas, adding actions using a drag-and-drop interface. On an iPhone Plus models or iPhone XS Max, this works particularly well in landscape, with an iPad-like dual-pane interface. 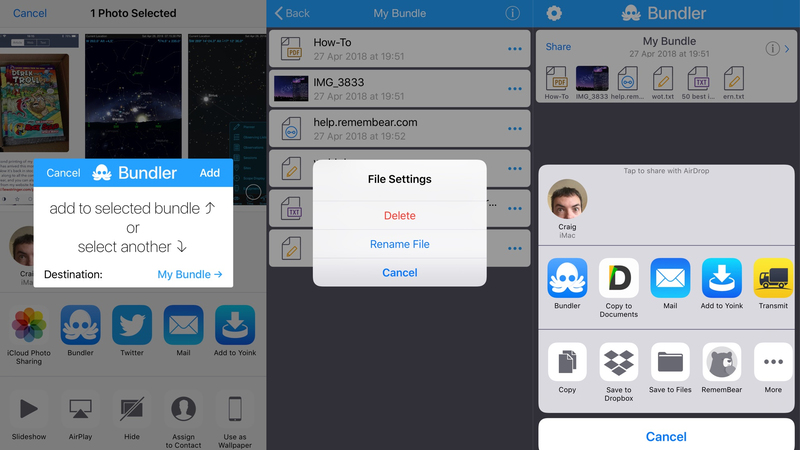 Bundler hugely speeds up and simplifies the process of creating and sharing ZIP archives on an iPhone. As long as the apps you want to share something from support the standard iOS Share sheet, they’ll work with Bundler. Select your document, tap the share button, and you can then send the file to the displayed ‘bundle’, or create a new one. Open up the main Bundle app and you’ll see your bundles. These can be renamed, as can individual documents within bundles. Usefully, many document types can be previewed inside of Bundle too, so you can check you’ve grabbed the right ones. Once you’re happy with your selection, you tap the Share button and send the bundle to an app or cloud storage as a ZIP. It’s fast and far more efficient than other apps of this type. Wunderlist is a hugely popular to-do list manager. It’s easy to see why: the app is simple to use, and yet provides depth and advanced features for those who need them. You start by dumping your to-dos in an inbox, at which point you can organize them into lists, add deadlines and reminders, define sub-tasks for more complex projects, attach files, and set regular tasks to repeat. Unlike Apple’s Reminders app, reordering tasks (alphabetically, or by due date) is a cinch, and lists can be shared across a wide range of platforms. All of this is entirely free (there’s a paid tier, but you’re unlikely to need it), so if you want a better to-do manager than Reminders but don’t fancy splashing out, this is the app to go for. Meteor is an internet speed tester designed for human beings. It eschews complex information – and even advertising – and instead provides you with straightforward, colorful buttons and readouts. An inviting ‘Start Testing’ button kicks things off, whereupon the app sets about checking your internet connection’s performance, a little meteor animating on-screen as it does so. Once the tests are done, speeds are scored, and are subsequently available from the History tab. Meteor also attempts to estimate how well your connection would fare with popular apps and games, six of which can be added to an ‘app performance’ bar. 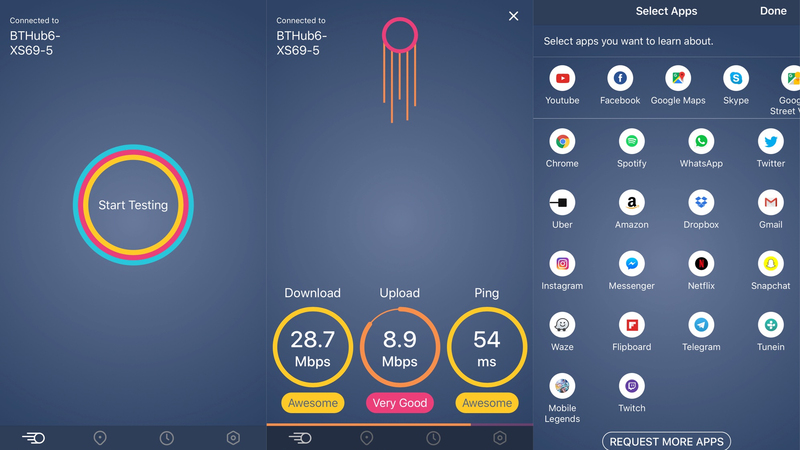 These values should perhaps be taken with a pinch of salt, but this freebie nonetheless impresses for being a no-nonsense, user-friendly, ad-free way to check internet connectivity. Apple’s pre-loaded Clock app has a perfectly serviceable timer – but you only get one countdown at any given moment. MultiTimer, as its name might suggest, gives you multiple timers that you can set going simultaneously. On launching the app, you’ll find six timers already set up. Each has a different color, name and icon. Tap a timer and it starts, tap again to pause, or double-tap to reset. Easy. 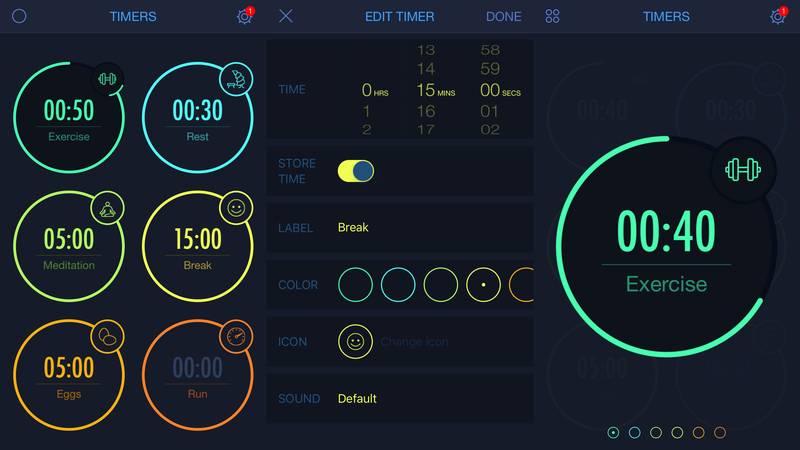 Long press and you open the timer’s options, so you can adjust its default time, label, color, icon and sound. You also have plenty of preferences to delve into, including adjusting the default workspace. Should you want extra workspaces – or a custom layout – grab the $4.99/£4.99/AU$7.99 MultiTimer Pro IAP. 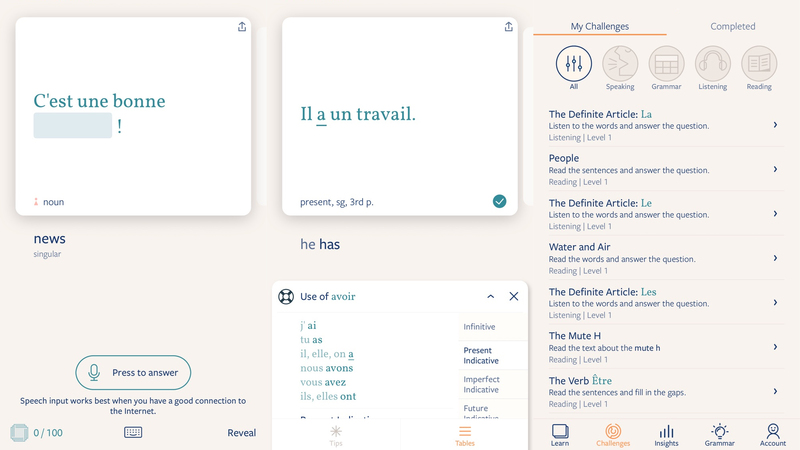 From the brains behind game-like language-learning app Duolingo comes Tinycards. The aim is to enable people to memorize anything by way of friendly flashcard sets. 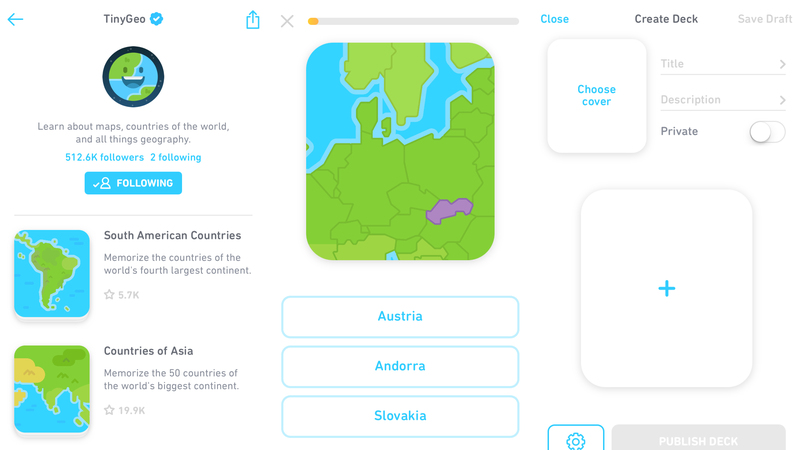 Duolingo itself offers a number of sets based around language, history and geography. Smartly, though, anyone can create and publish a set, which has led to hundreds of decks about all kinds of subjects, from renaissance art to retro computing. The memorizing bit is based around minutes-long drills. You’re presented with cards and details to memorize, which the app then challenges you on, by way of typing in answers or answering multiple choice questions. Some early teething problems with typos and abbreviations (for example, stating ‘USA’ was incorrect because ‘United States of America’ was the answer) have been dealt with by way of a handy ‘I was right’ button. Just don’t press it when you don’t really know the answer, OK? The idea behind Cheatsheet is to provide fast access to tiny chunks of information you never remember but really need to: your hotel room, your car&apos;s number plate, Wi-Fi passwords, or, if you&apos;re feeling suitably retro, the Konami code. Set-up is pleasingly straightforward. Using the app, you add &apos;cheats&apos; by selecting an icon and then typing your info nugget. When you&apos;ve got yourself a number of &apos;cheats&apos;, they can be reordered as you see fit. Once you&apos;re done, the entire lot can be displayed on the Today widget or an Apple Watch. 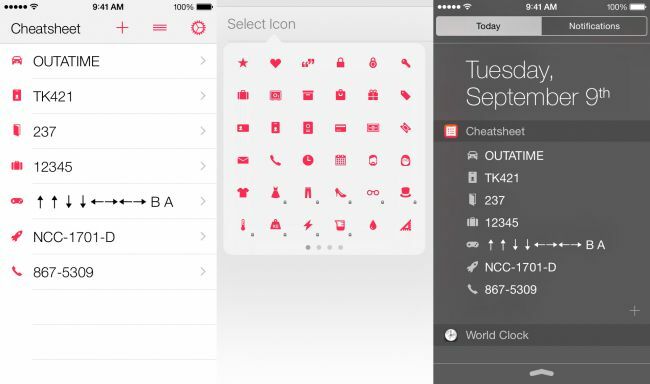 Cheatsheet saves some features for a $2.99/£2.99/AU$4.49 &apos;pro&apos; upgrade – a custom keyboard, an action extension, some of the icons, and iCloud sync. But the free version is nonetheless useful and generous, along with making really good use of the Today view on your phone. We keep hearing about how important coding will be to the future of everything. That&apos;s all very well, unless code makes about as much sense to you as the most exotic of foreign languages. The idea behind Lrn is to gently ease you in. Through friendly copy and simple quizzes, you gradually gain confidence across a range of languages. Dropbox was a big deal in the early days of iOS. When Apple refused to provide access to a file system, Dropbox became a surrogate, and was supported by a great many apps. But you might ask if it has a place now Apple offers Files. The answer is yes. Dropbox can act as a Location within Files, which is great if you use Dropbox to share folders with people running various systems. 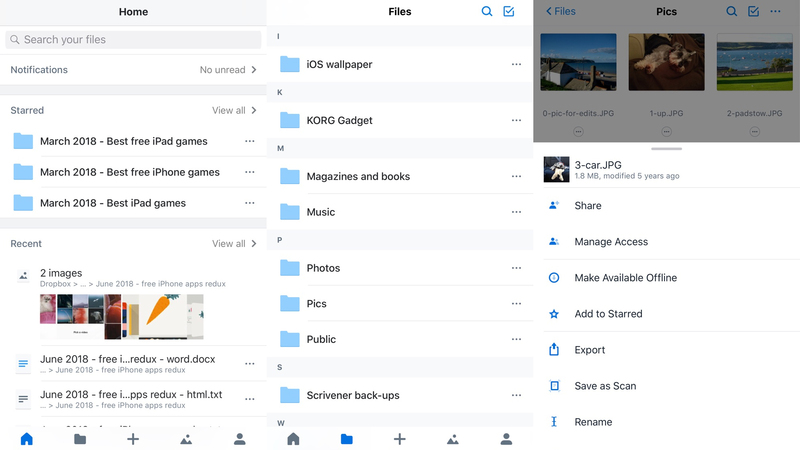 But the standalone Dropbox app also excels: it can quickly scan receipts and whiteboards to PDF; you can use it to edit Microsoft Office documents; and it’s possible to comment on files to share feedback with a team. For free, you get 2GB of space. If you need more, Dropbox Plus gives you 1TB for $9.99/£7.99/AU$13.99 per month. 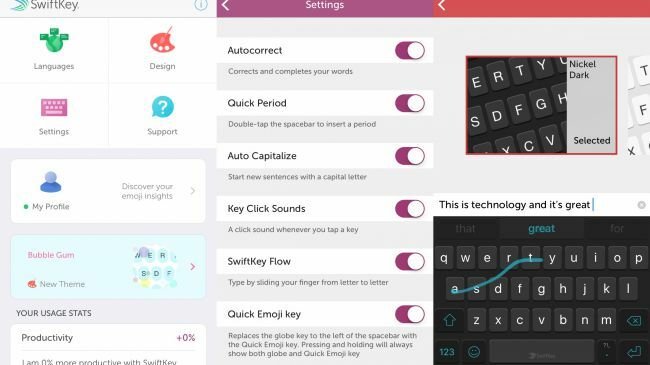 SwiftKey reasons that you could – and should – be typing a lot more quickly on your iPhone’s keyboard. Mostly, it achieves this by freeing you from the drudgery of having to tap individual keys or even bother stabbing at the prediction bar – instead, you just lazily swipe about in the vague direction of the keys you want. During your early days with the app, this occasionally results in some comical typos, but pretty soon you end up swipe-typing at speeds you’d never thought possible. And beyond the keyboard’s AI smarts, there’s customization to delve into, including custom themes and colors, enough emoji to choke a hippo, and some very handy bilingual support for when you need to quickly switch between languages. 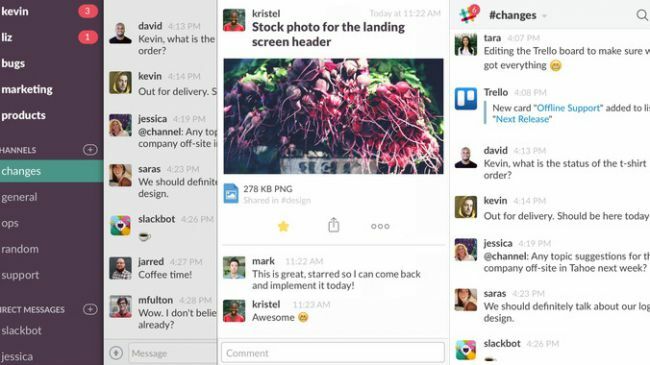 The thinking behind Slack is to free teams from the drudgery of email. It&apos;s essentially a real-time messaging system, where people have group conversations based around user-defined hashtags, or send private messages to one-another. 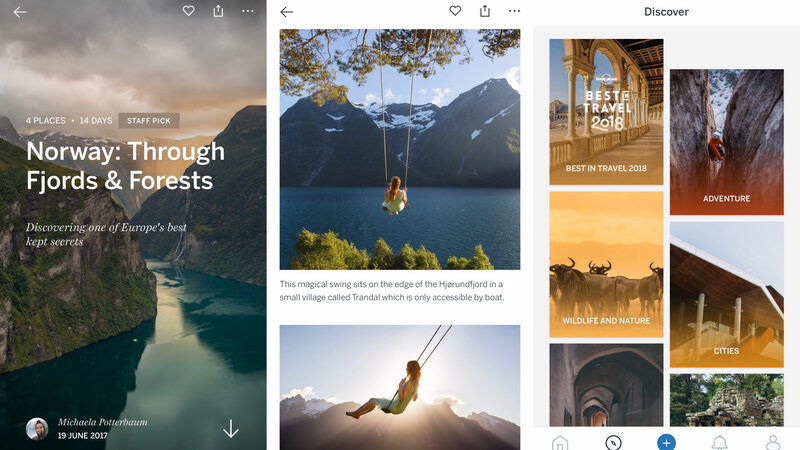 Support for inline images, videos and Twitter-like summaries boost pasted content, and the app integrates with cloud storage from the likes of Dropbox and Google Drive. It&apos;s worth noting that while Slack is clearly aimed at businesses, it works perfectly well as a means of communication for groups of friends who aren&apos;t thrilled about storing their personal insights and details on Facebook. We&apos;re told the &apos;S&apos; in Vert S stands for &apos;speed&apos;. 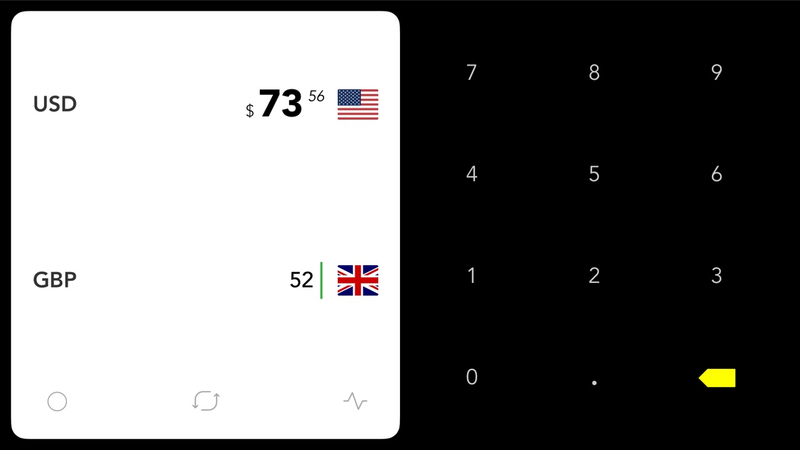 This is down to the app being an efficient incarnation of the well-regarded Vert unit converter. The older app had you browse huge category lists to pick what you need, but Vert S is keener on immediacy. There&apos;s a search, but the app&apos;s core is a Favorites page, where commonly used conversions are stored. Our favorite free iPhone apps for mapping, sat-nav, translation, learning languages, weather forecasts, currency conversion and holiday planning. Saildrone Forecast – Weather is gunning to be the most beautiful weather app on your iPhone. Its dark interface is arresting, not least when vibrant clouds billow over the landscape, forecasting whether you’re due for a soaking. With the means to add an animated wind layer, it feels a lot like Ventusky or Dark Sky, albeit without the price tags those apps command. Everything outside of the map is pretty great too. The upcoming forecast is clear and readable; a glanceable ‘what to wear’ graphic is amusing and useful; and there are temperature, rain, and wind graphs for weather geeks who like delving into detailed data. There’s the odd quirk, and the omission of an imminent rainfall graph is a pity. But given how great it looks and works (no ads! ), Saildrone is well worth installing. 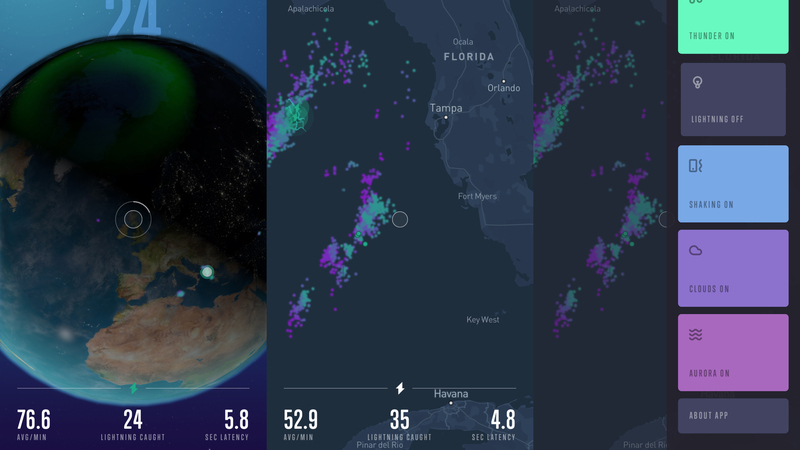 Thunderly is an entertaining and unique weather app with a penchant for storms. Fire the thing up, and you get a photorealistic Earth you can spin beneath a finger. Zoom in and you can go hunting for storms. The app provides a number of options for enhancing the experience. It emits blasts of thundery noise, and can rumble your iPhone. Entertainingly, it’ll also use the flash to simulate lightning. If you zoom right into your location, you can measure how far away a storm is by prodding a button when lightning strikes, and then a second time when you hear thunder. 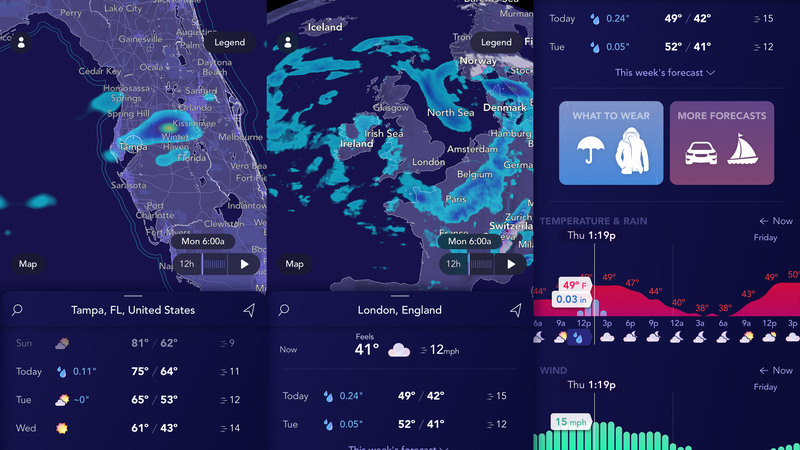 Naturally, Thunderly isn’t a replacement for a traditional weather app, but as a free download, it’s an entertaining diversion if you’ve an interest in weather. 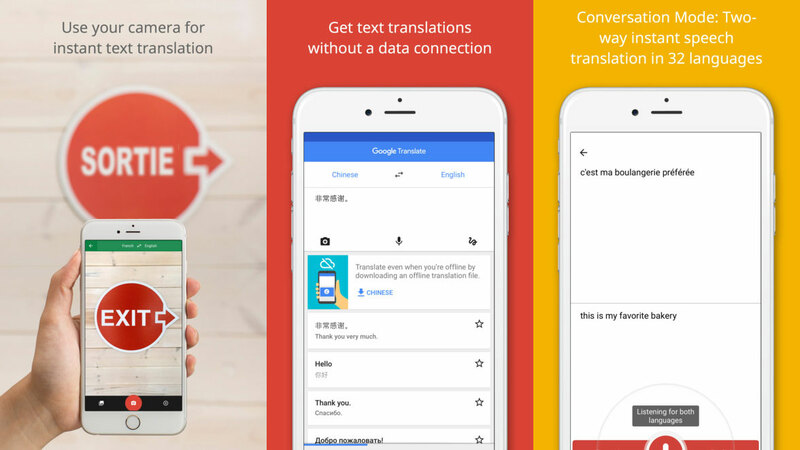 Google Translate is like having an entire crew of translation staff in your pocket. When online, it can translate text and conversations between dozens of languages, giving you a fighting chance at a to-and-fro in a foreign tongue when you’re stuck for other options. Favorite words and phrases can be saved, to build up a personalized phrasebook. But the real magic comes by way of the camera. Point Google Translate at some text and as long as it’s reasonably legible, it will attempt to translate it live, into your chosen language. You’re not going to be reading a book in this manner, but when you’re abroad and staring quizzically at a menu or the ingredients on a food packet, Google Translate can be a life-saver. Koins is a rare currency converter that appears to have been designed with humans in mind. Rather than you dealing with a utilitarian ‘afterthought’ interface, you instead get something akin to a futuristic, playful calculator. Yes, we know, playful isn’t usually a word you’d associate with this kind of app, but it’s fun to hear the bloops and bleeps as you tap out numbers and choose your currencies. 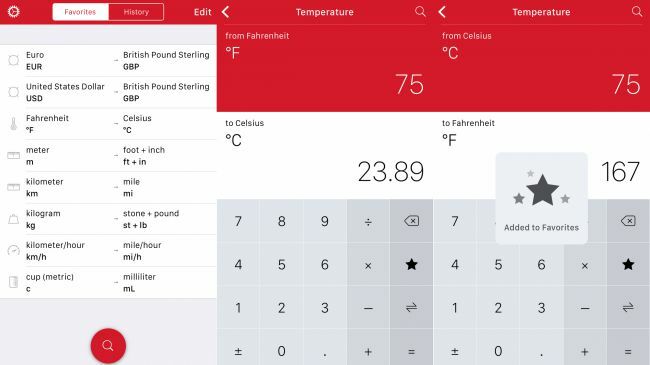 Naturally, Koins has more serious features, too: you can squish the keyboard for one-sided use (or use the app in landscape), and sync data via iCloud. However, if you want to check out how currencies have performed over time, you’ll need to unlock the premium version with IAP. 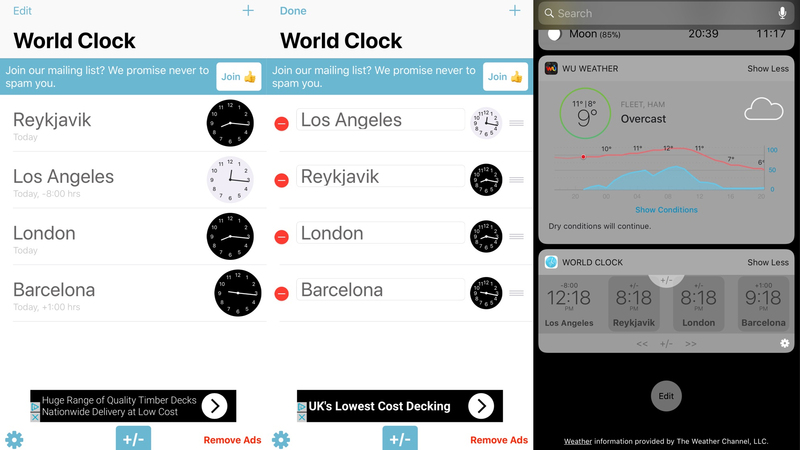 World Clock Time Widget does what you’d expect from its name, enabling you to set up a world clock that’s visible at a glance in Today view. Setup is straightforward. Tapping a + button gives you a list of locations. You can type a place name to rapidly filter the list, then tap an item to add it to your clocks. Locations appear in order from west to east, although you can rearrange them manually. The widget shows your first four clocks in Today view, but can be expanded to show more. Neatly, you can also move the clocks forward and backward by hourly increments. It’s a pity you only get a digital view – analog clocks are only available within the app – but otherwise this is a solid freebie. Trips by Lonely Planet is an app for sharing travel experiences – or just reveling in the journeys made by others. It’s a bit like a travel-oriented Instagram mixed with a smattering of travel guide and blog. If you like gorgeous photography and a touch of commentary for context, it’s a must-have install. When you have an adventure of your own, you can upload your own story. The layout options are a bit basic, but the app is really easy to work with, making for stress-free sharing. Google Maps is an app that’s been a mainstay in this list for years – and it’s easy to see why. Although Apple’s own Maps app has hugely improved since launch, Google Maps retains the lead in almost every way. It’s superb at locating points of interest –whether you’re looking for a distant town or local restaurant – and offers robust public transport suggestions. Beyond that, it just proves handier than Apple’s app. Street View is great for virtually scoping out a location, looking for landmarks that might prove handy during a drive. You can draw a route to measure the distance between two places. 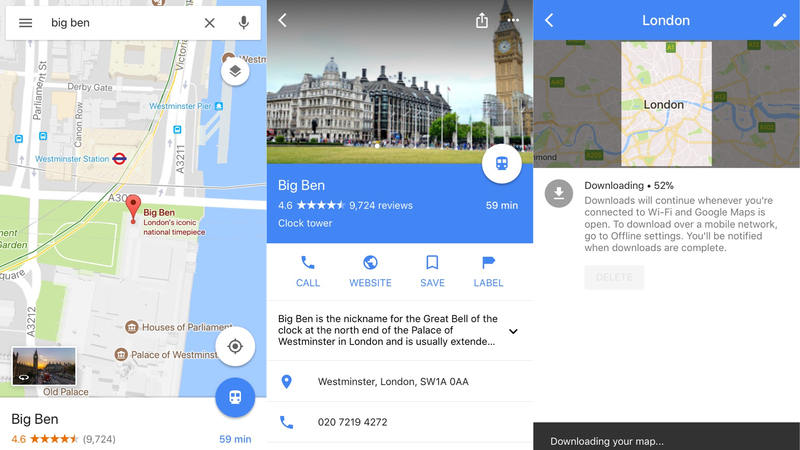 And best of all, you can download maps to your iPhone, transforming Google Maps into a free sat-nav equivalent that works entirely offline. Google Earth simply gives you our planet in the palm of your hand, and encourages you to explore. You can manually rotate and zoom, search for specific locations, or take your chances with the dice icon, to check out somewhere random. Wherever you end up, Google Earth provides local photography and information, becoming something of a virtual tour guide. 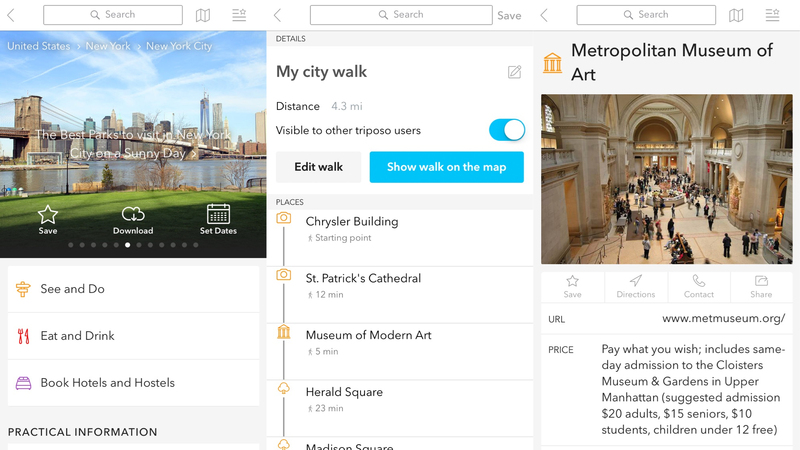 Places others have explored nearby are provided as cards, which prove genuinely useful for giving crowdsourced points of interest or recommendations. This concept reaches its logical conclusion with Voyager – a selection of journeys you can take to some of the world’s most amazing sights, from ancient wonders to modern ones like Kennedy Space Center. 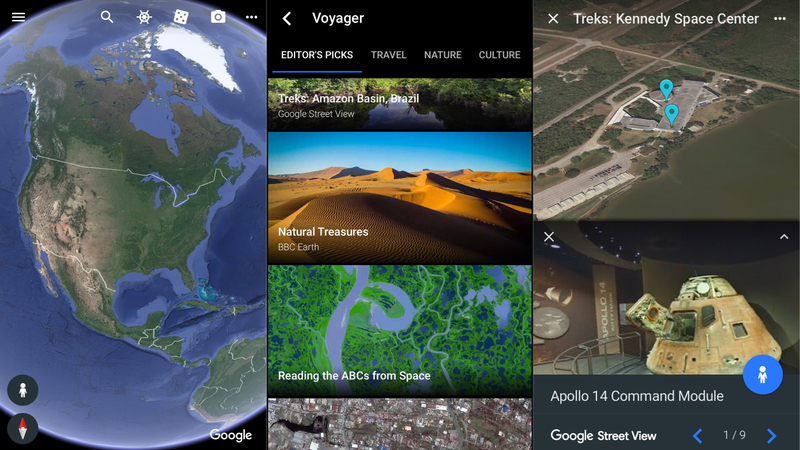 Google Earth’s visual majesty is lessened on the smaller screen, but it’d be churlish to scoff at an app that in an instant provides access to so much of our planet. Lingvist is a language-learning app that claims to be able to teach you at light speed. Naturally, that’s hyperbole, but Lingvist nonetheless has a methodology and interface that gets you going in your chosen language (French, Spanish, German, and Russian are supported) at serious speed. Mostly, it’s about plugging words into sentences, in a drill-like fashion. Imagine interactive flash cards thrown your way in quick-fire fashion and you’re there. The underlying algorithm tracks words you’re finding tricky, and in-context explanations for things like verbs pop up as and when they’re needed. Will Lingvist make you fluent in hours? Probably not. But as a refresher, or even a first step in learning a foreign tongue, it’s the best freebie around on iPhone. 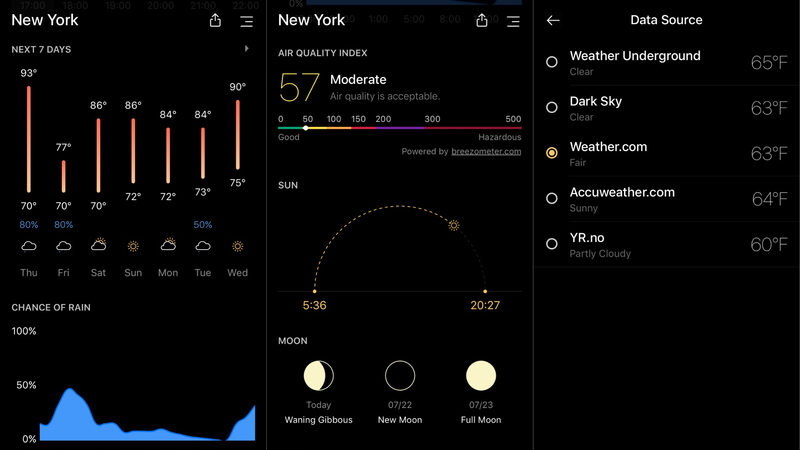 Today Weather provides a sleek, elegant take on weather forecasting, marrying modern design, usability, and a slew of data. Set a location and you get current conditions below a supposedly representative photo. (The photo is, frankly, a bit rubbish but can fortunately be disabled.) Scroll to delve into predictions about the coming hours and days, and details about UV index and pressure, the chances of imminent rainfall, air quality, sunrise/sunset times, and what the moon’s up to. Sadly, these components can’t be rearranged, and anyone who wants a rainfall radar will have to pay for it. But these drawbacks shouldn’t stop you downloading what’s a great freebie weather app. Also, Hello Weather has a trump card in its data source menu, which lists conditions and temperatures from five different providers. If one regularly seems better than the others, you can switch with a tap. Nice. Billed as ‘your smart travel guide’, Triposo elevates itself above the competition. First and foremost, it’s comprehensive. Whereas other guides typically concentrate on a few major cities, Triposo drills down into tiny towns and villages as well, helping you get the best out of wherever you happen to be staying. 50,000 destinations worldwide are included, complete with information on bars, restaurants, hotels, tours and attractions. Beyond that, the app is easy to use, and it optionally works offline, enabling you to download guides on a regional basis. This is perfect for when you’re ambling about somewhere new, without a data connection. And if you’re unsure where to head, Triposo can even build an editable city walk for you too. 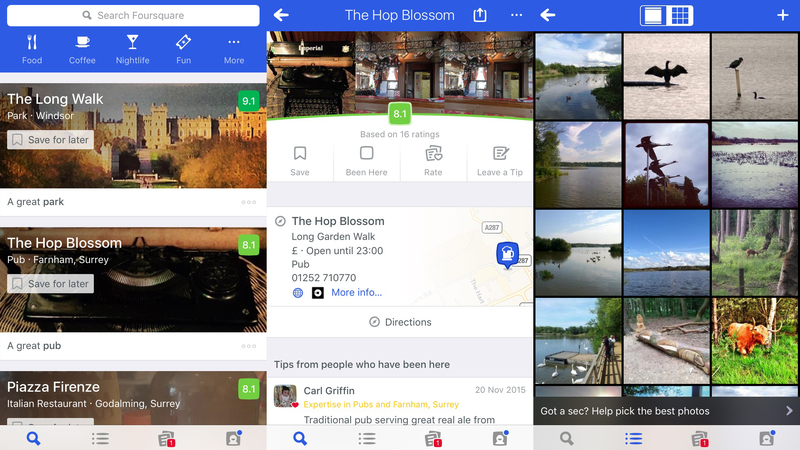 One-time darling of the digital check-in crowd, Foursquare in 2014 reworked its app to focus entirely on local search. Although this irked fans who&apos;d been there since the beginning, it&apos;s hard to criticize the app we&apos;ve been left with. On iPhone, you start with a search field, beneath which sits a handy list of relatively local places of interest. Tap an item and you gain access to a photo gallery, basic details, and a slew of reviews. In the main, Foursquare is quite obsessed with food, drink and nightlife, but the &apos;fun&apos; and &apos;more&apos; categories house plenty of additional places to visit, from gig venues and cinemas to rather more sedate options like parks and historic sites. Filters and &apos;tastes&apos; options within the app&apos;s settings enable you to further hone down recommended choices, and anything you fancy reminding yourself of on a more permanent basis can be added to a custom list. 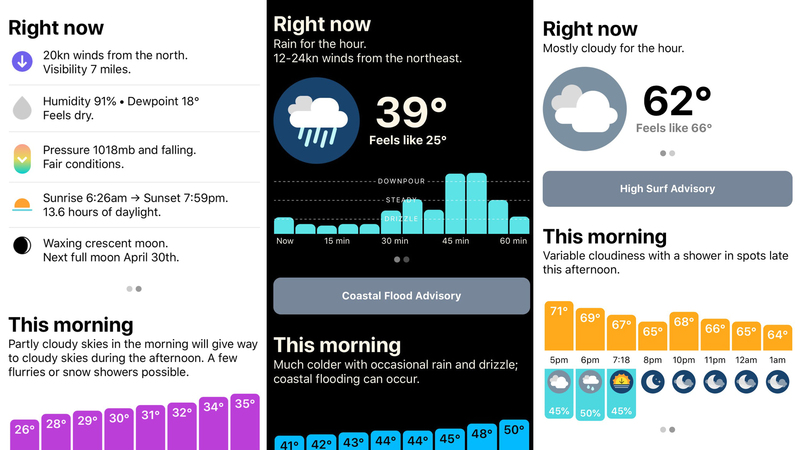 There&apos;s a tendency for weather apps to either bombard you with facts or try to be too clever with design Hello Weather, by contrast, simply wants to get you all the weather information you need, but nothing you don&apos;t.
This focused approach doesn&apos;t mean Hello Weather is an ugly app. On the contrary, it&apos;s very smart, with a clean layout and readable graphs. Mostly, though, we&apos;re fond of Hello Weather because it eschews complexity without limiting the information on offer. The single-page view is split in three, covering current conditions, the next few hours, and the week&apos;s forecast. If you need more detail, a swipe provides access to things like sunrise/sunset times for the current day, or written forecasts for the coming week. It’s worth noting that some functionality lurks behind annual IAP, such as real-time rainfall estimates and multiple weather sources. But as a free no-fuss weather app, Hello Weather is hard to beat. Citymapper is a travel aid that wants to help you get around big cities more easily. Unlike Google Maps, it doesn’t work worldwide, instead carefully selecting places that get coverage. 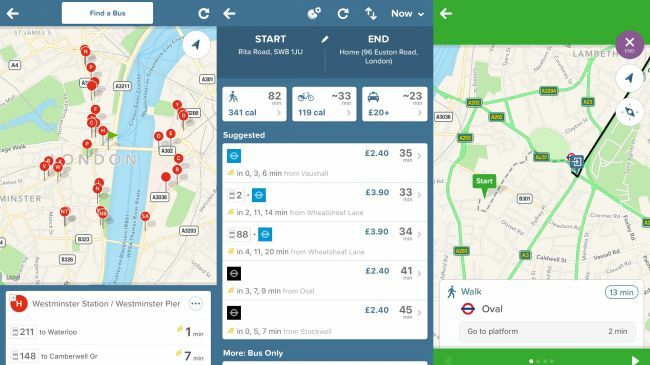 But if you live in or visit one of the supported cities – which include London, Paris, Berlin and New York – Citymapper is an essential download. The app will quickly zero in on your location. When you need to get somewhere else, Citymapper makes it easy to compare all of your options in real time. But it’s the smaller features that properly cement its place on your iPhone: watching buses move about a live map; advice about the best train carriage to take; and real-time alerts when you should get ready to disembark – great when you’re dozing at the end of a busy day. The Weather Underground app (or &apos;Wunderground&apos; to your iPhone, which sounds like an oddly dark Disney film) is one of those products that flings in everything but the kitchen sink yet somehow remains usable. Whatever your particular interest in the weather, you&apos;re covered, through a slew of &apos;tiles&apos; (which can be moved or disabled to suit) on a huge scrolling page. At the top, you get a nicely designed tile detailing current conditions and showing a local map. Tick and cross buttons lurk, asking for input regarding the app&apos;s accuracy. During testing, we almost always tapped the tick — reassuring. Scroll, though, and you find yourself immersed in the kind of weather geekery that will send meteorological nuts into rapture. There are rainfall and temperature graphs for the next day and hour, along with simpler forecasts for the week. You get details on humidity, pressure and dew point. Sunrise, sunset and moon timings are presented as stylish animations. You can investigate local and global webcams and photos, and then head to the web if not satisfied with that deluge of data. 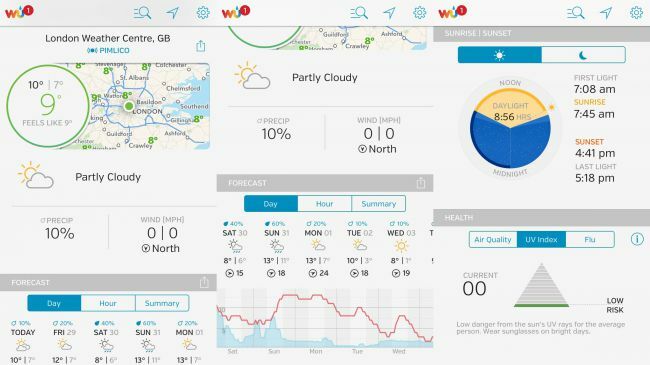 Weather Underground is funded by non-intrusive ads (which you can disable annually for $1.99/£1.99/AU$2.99 if you feel the need), and is easily our favourite free iPhone weather app; in fact, it even rivals the best paid fare on the platform.